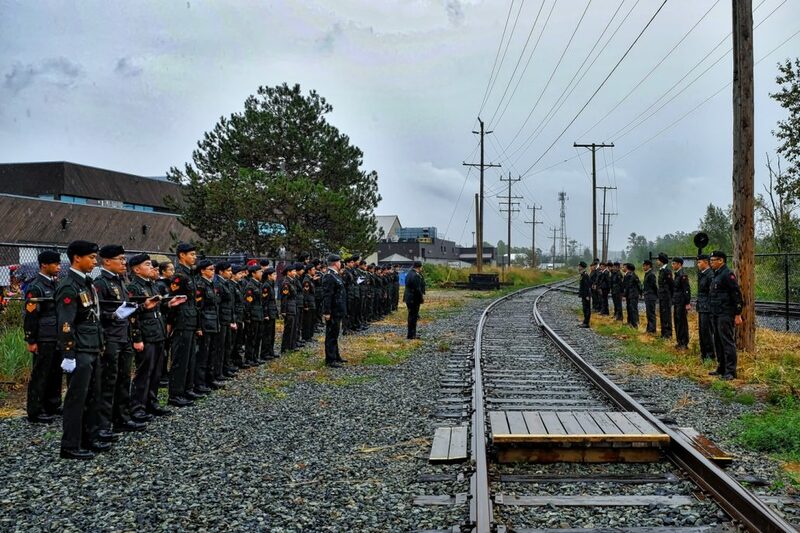 September 9th, 2017. 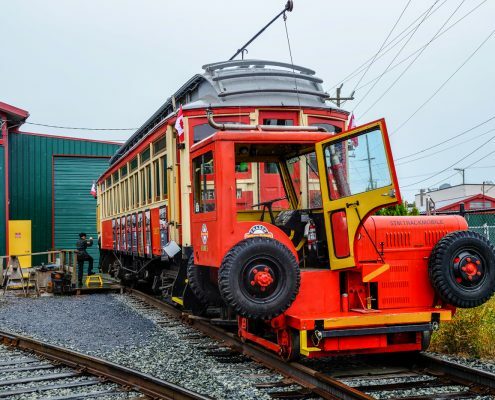 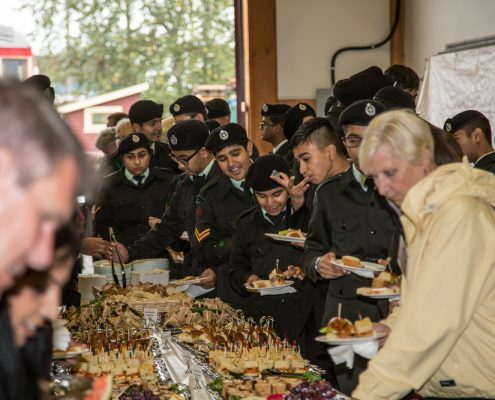 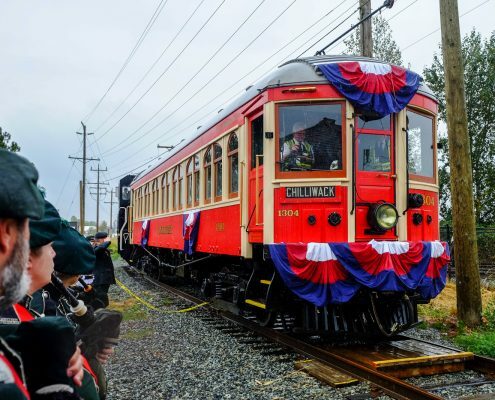 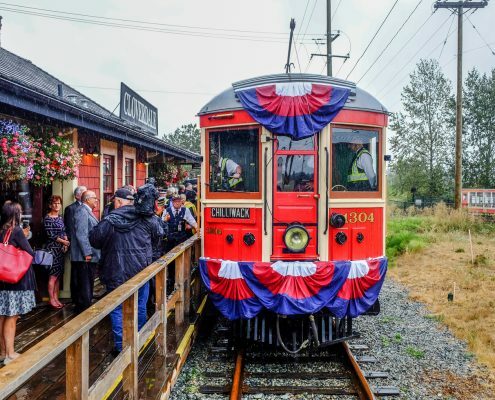 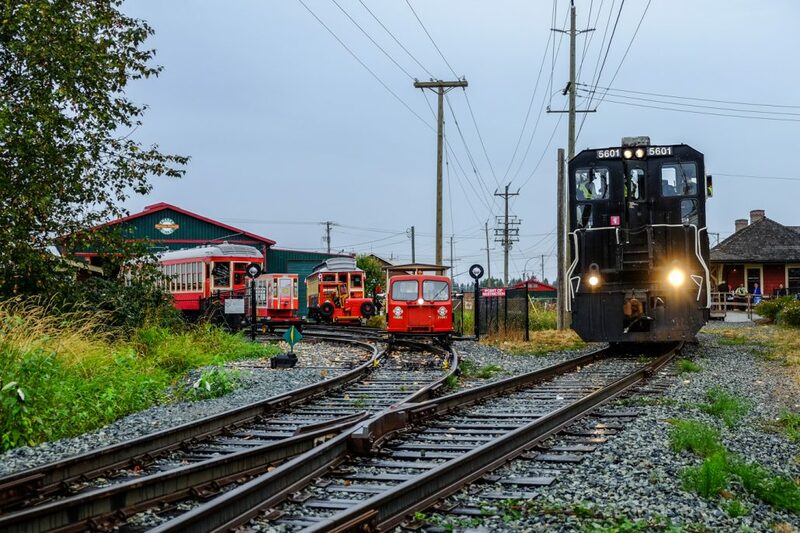 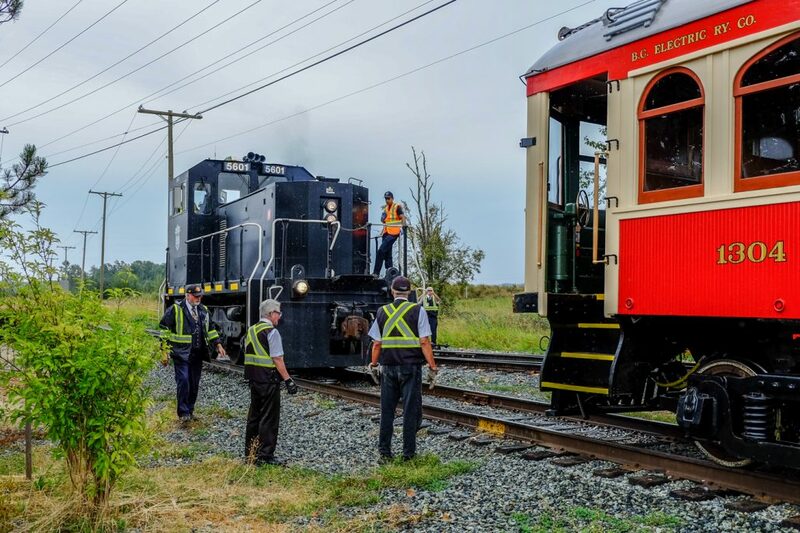 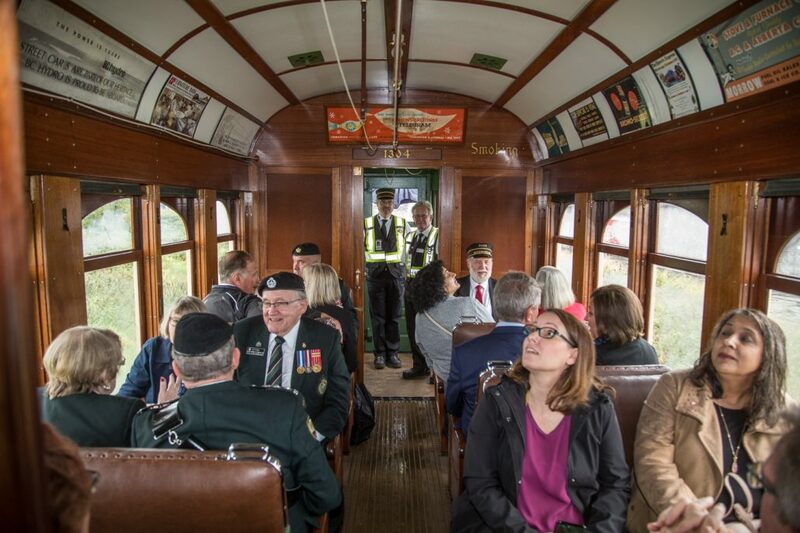 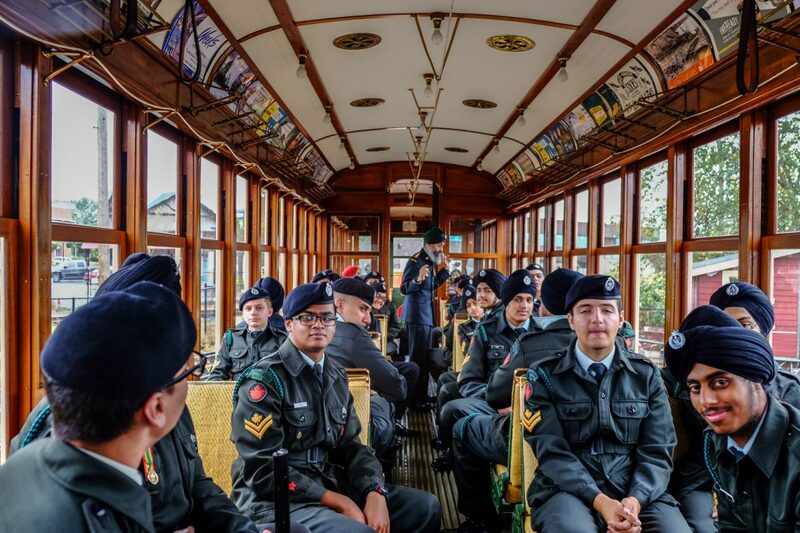 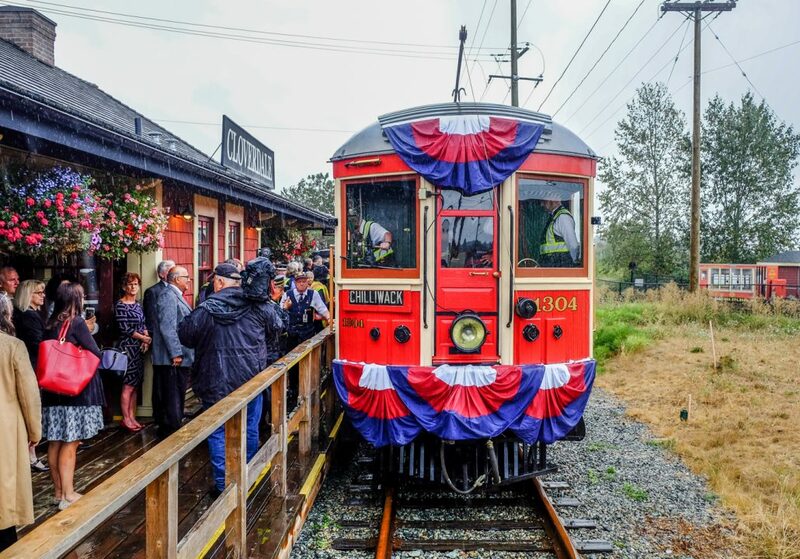 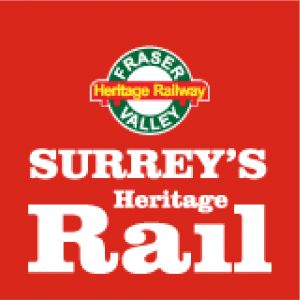 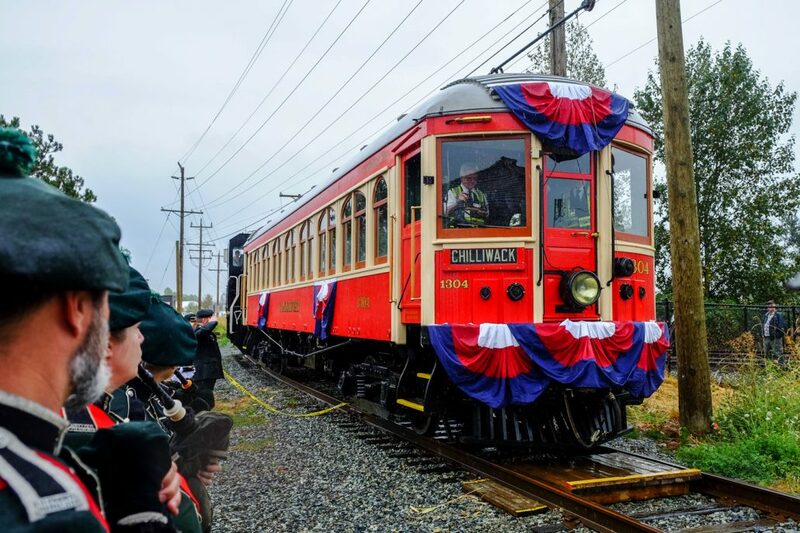 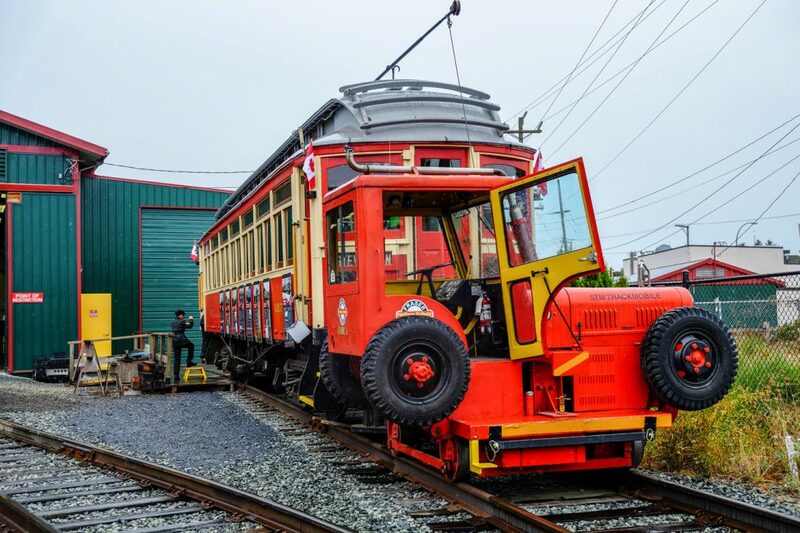 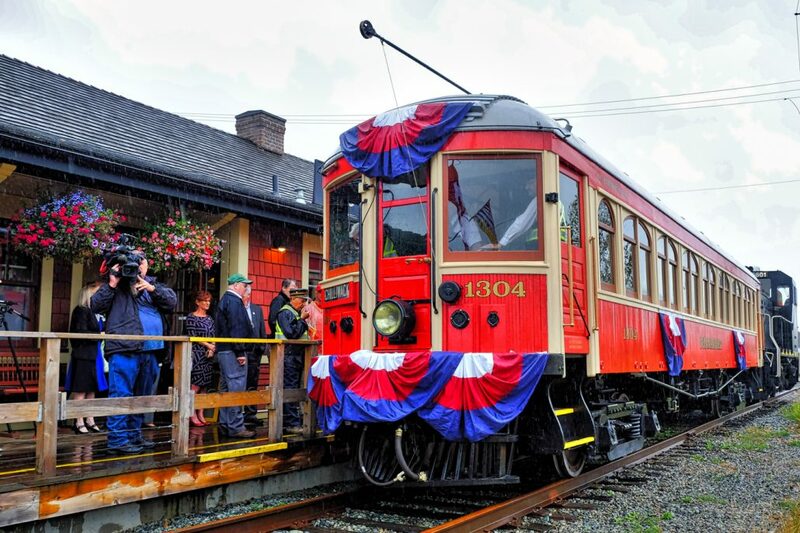 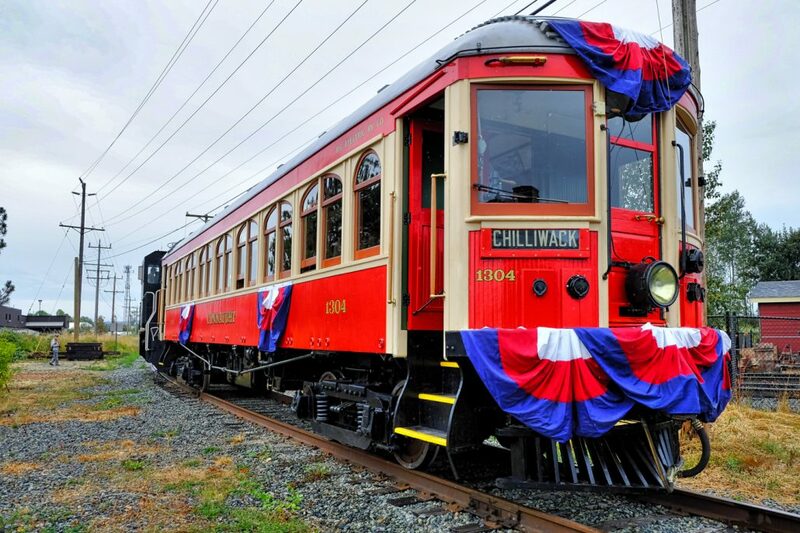 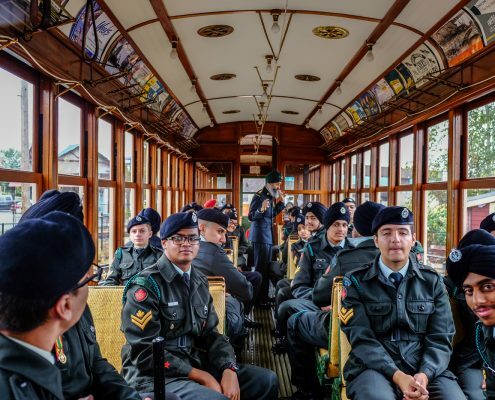 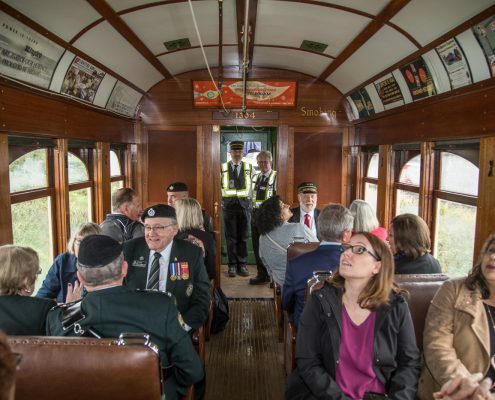 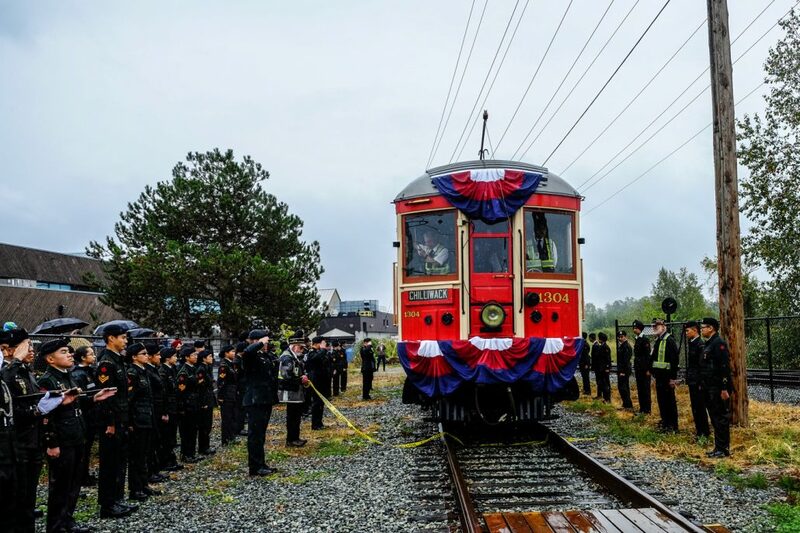 Another special day for BCER 1304, the Connaught, and the FVHRS – the official launch as our part of the Canada150 celebrations in Surrey. 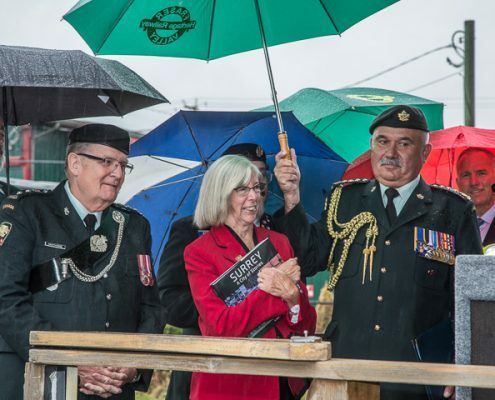 After three months of sunny days the rain arrived for one day – Sept. 9th of course. 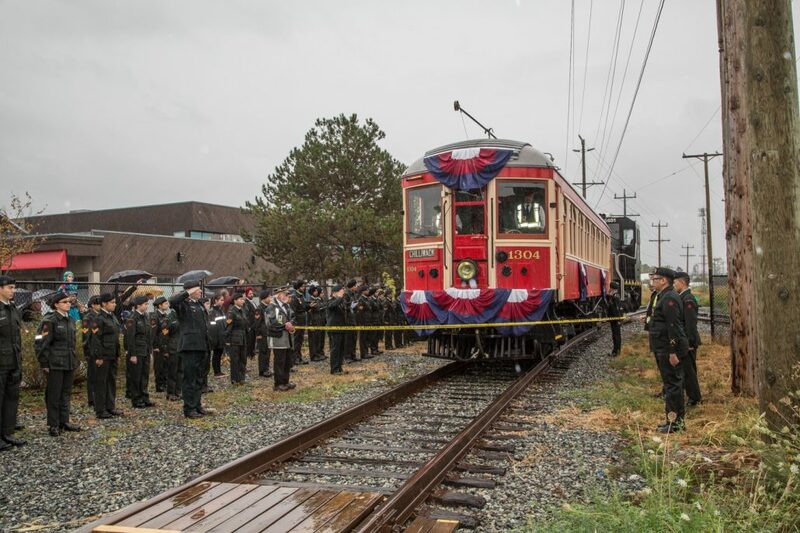 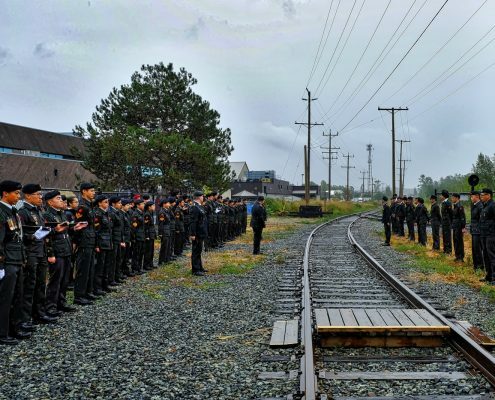 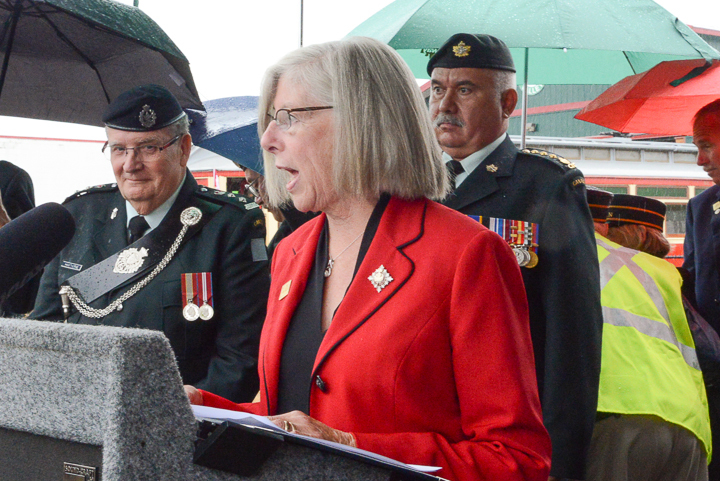 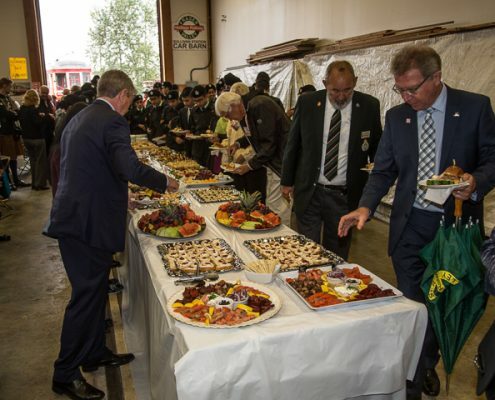 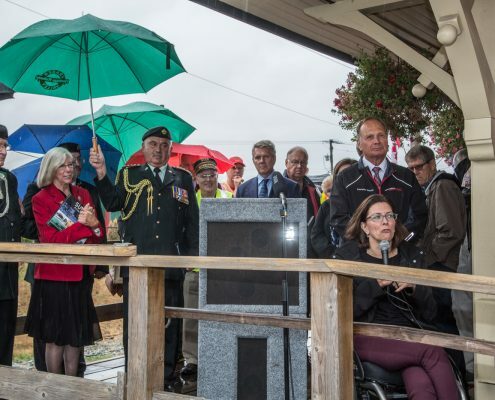 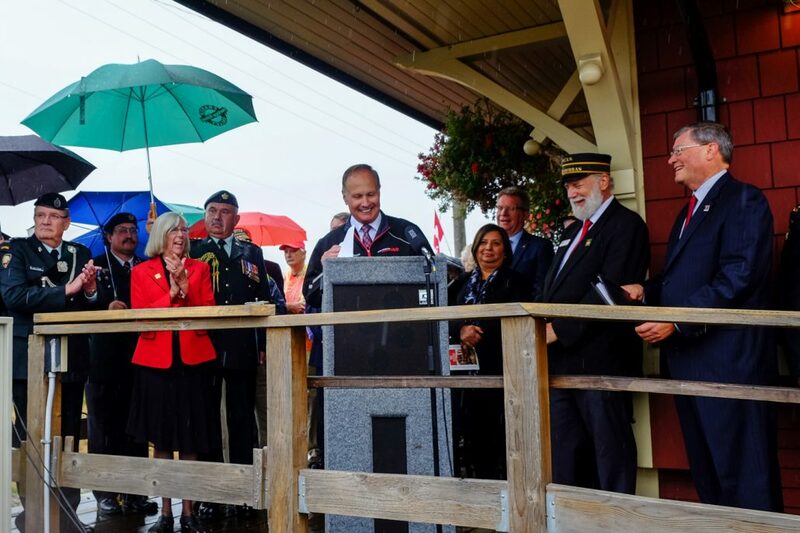 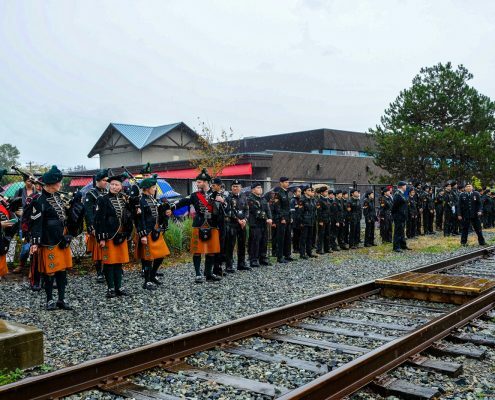 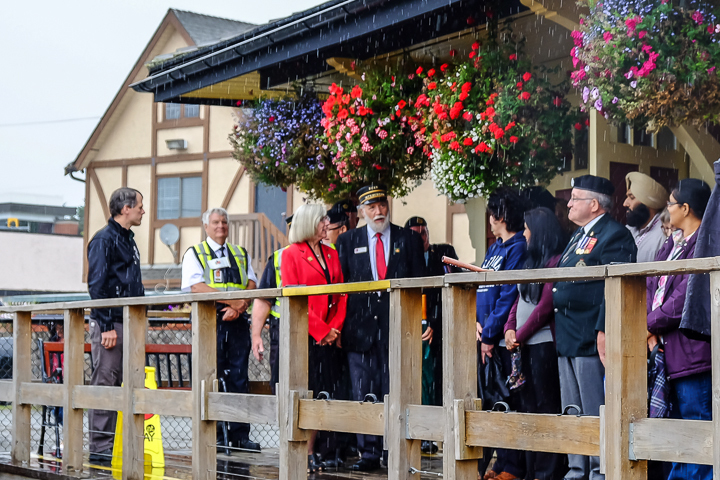 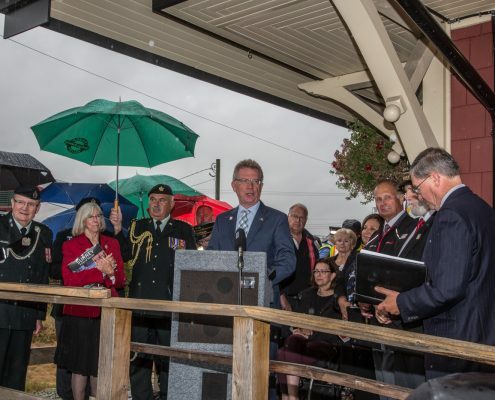 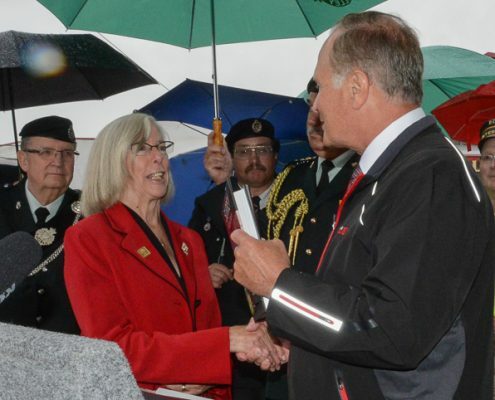 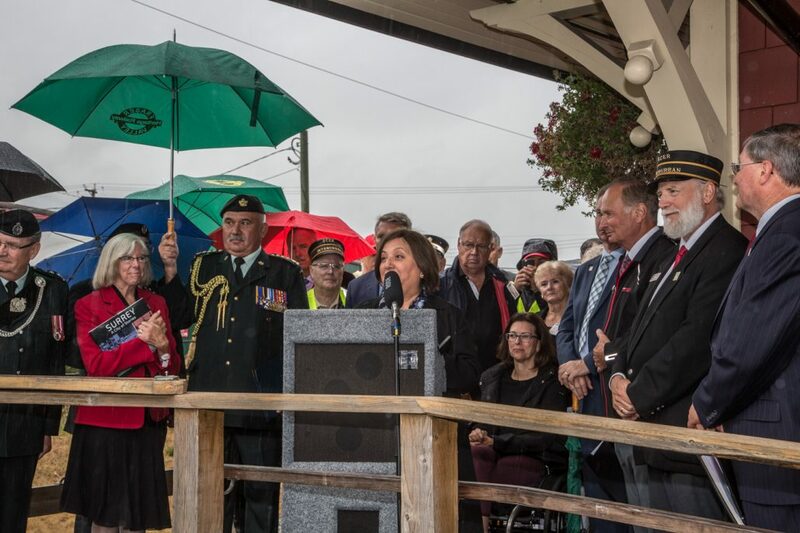 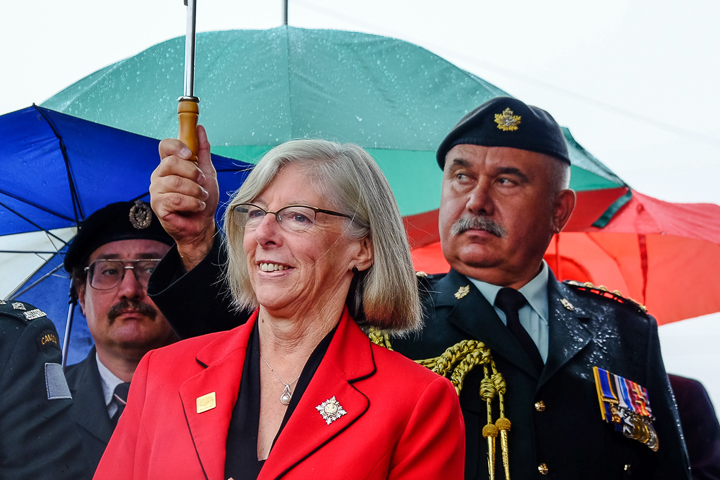 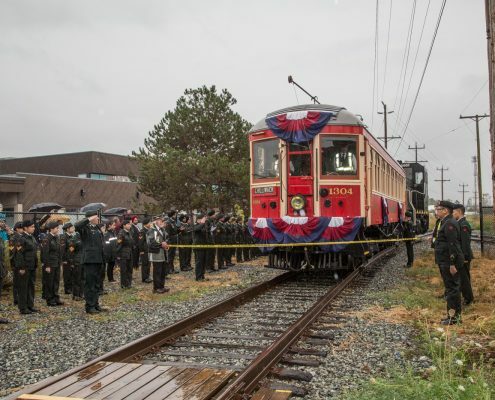 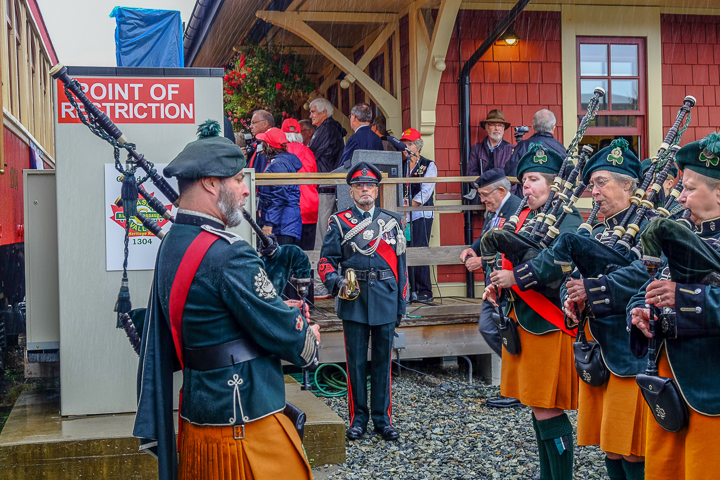 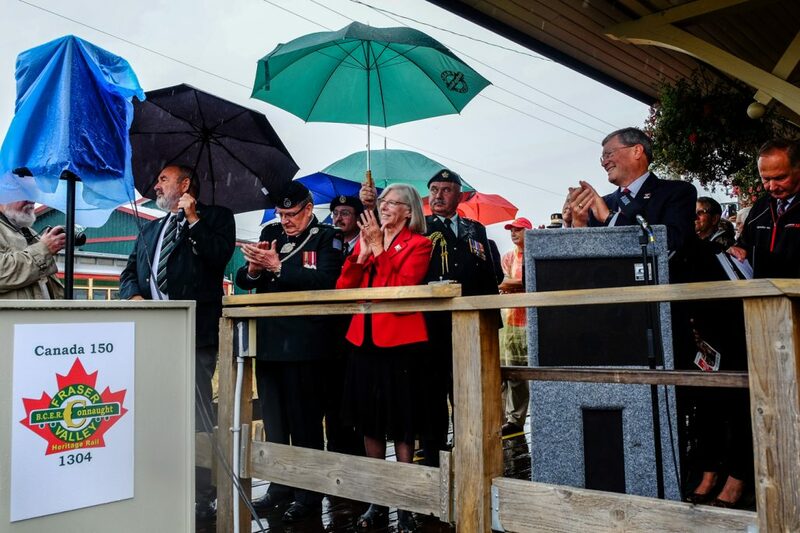 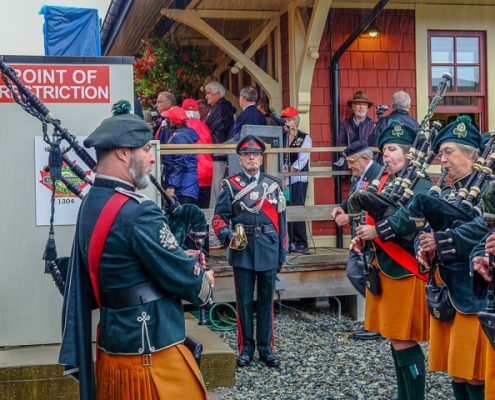 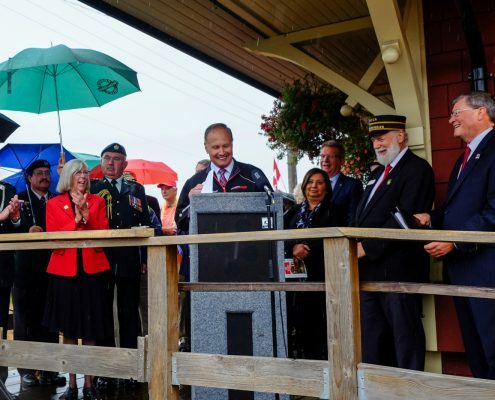 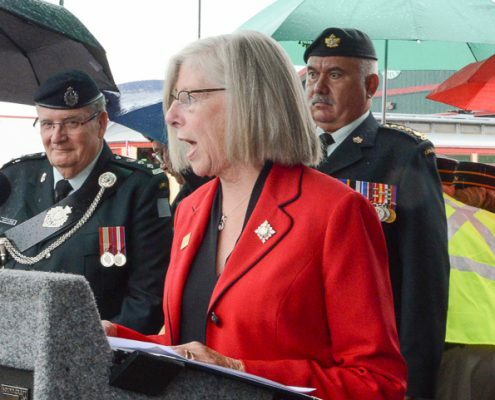 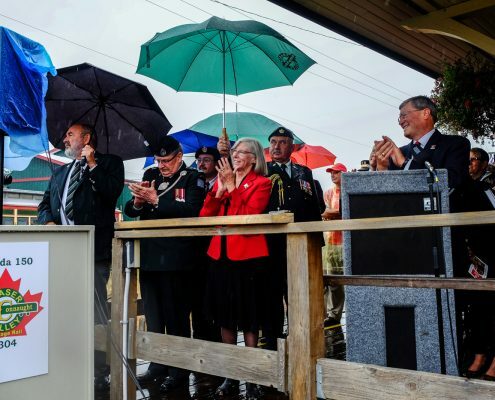 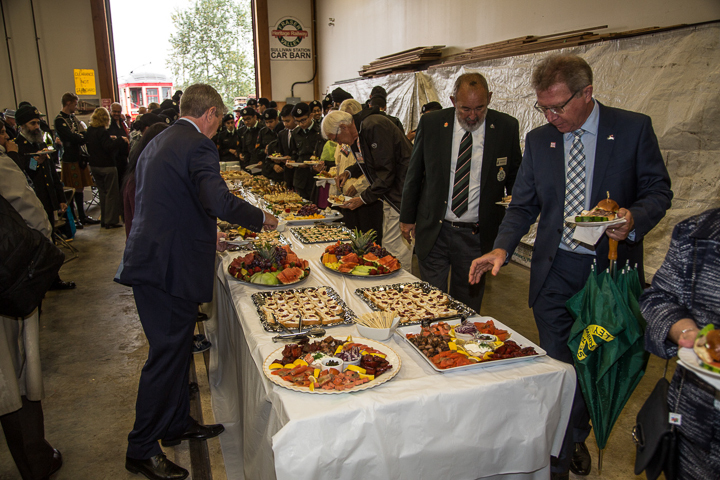 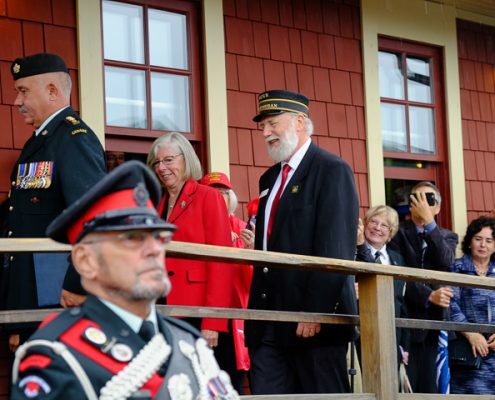 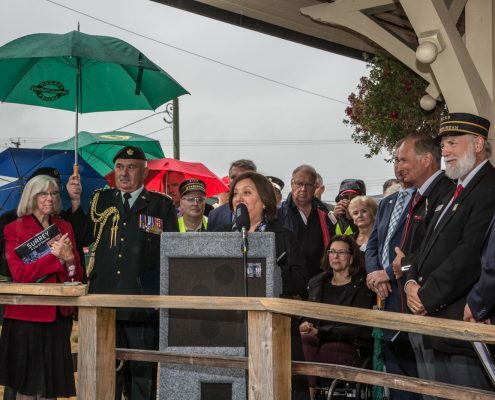 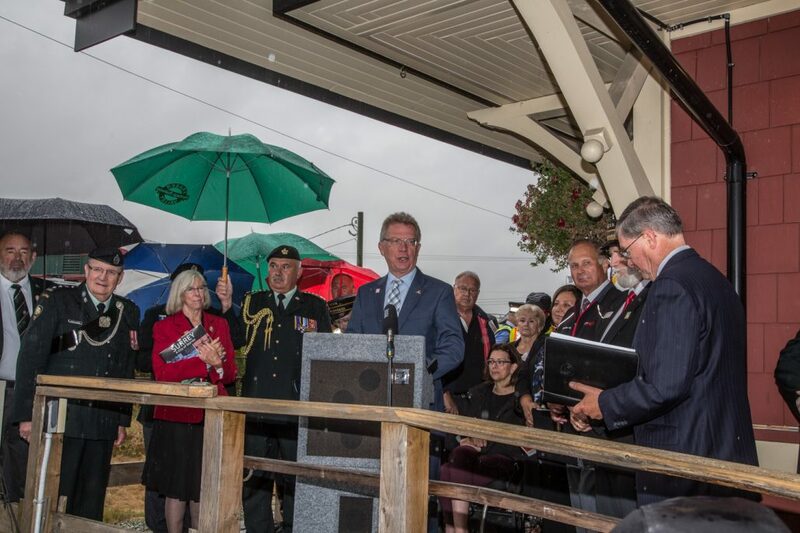 The Honour Guard of the British Columbia Regiment – The Duke of Connaught’s Own Rifles – along with the Regimental Irish Pipe Band spent more than enough time standing in the rain waiting to welcome both Her Honour, The Honourable Judith Guichon Lieutenant Governor of British Columbia and 1304 Connaught to the Cloverdale Station. 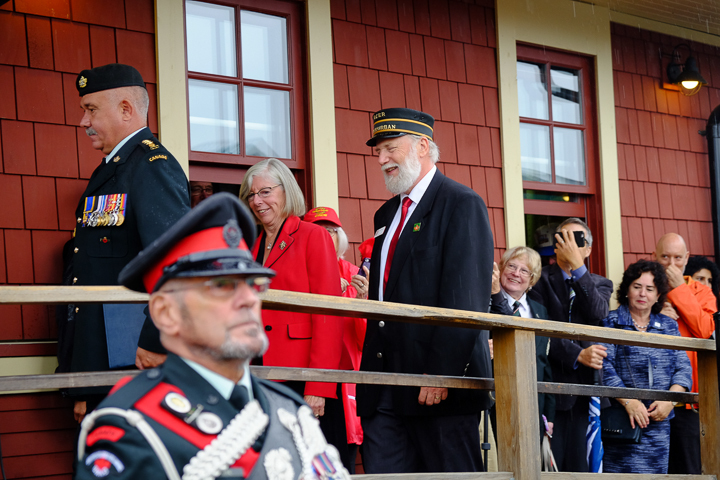 The Lieutenant Governor, acting in her official capacity as The Queen’s representative in British Columbia, reconnected the Royal linkage with 1304 from its days transporting HRH Prince Arthur, The Duke of Connaught and Strathearn Governor General of Canada 1911-1916 and his family during the Royal visit in 1912. 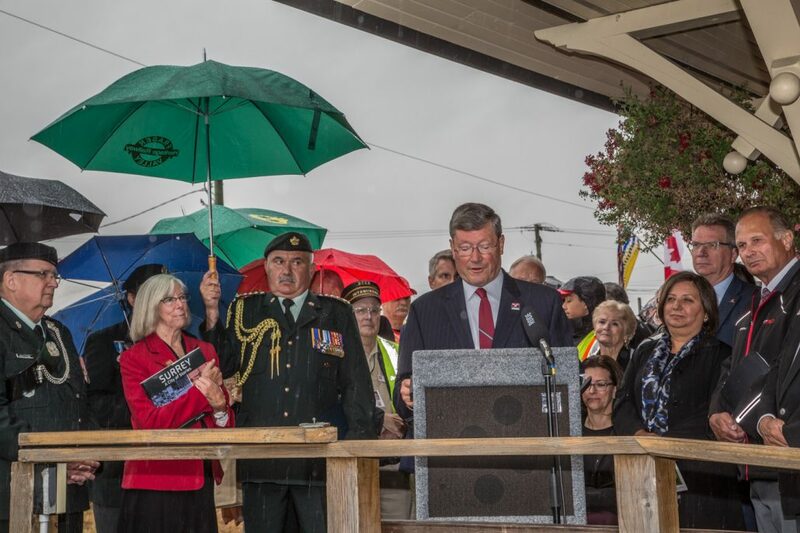 Councillor Dave Woods, chair of the Heritage Advisory Committee and Acting Mayor for the City of Surrey this day, brought greetings from Mayor Linda Hepner and the rest of Council. 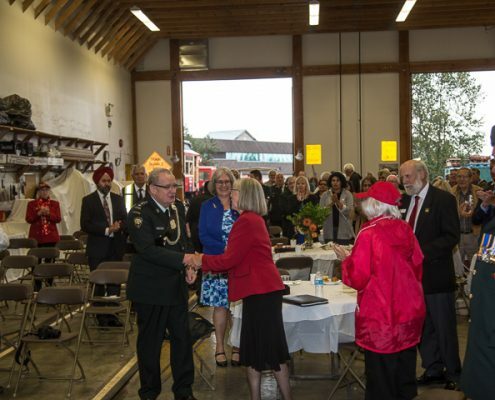 The Acting Mayor presented Her Honour with the very first copy of Surrey, A city of Stories by K. Jane Watt, the impressive Canada150 project by the Arts and Heritage division of the city. 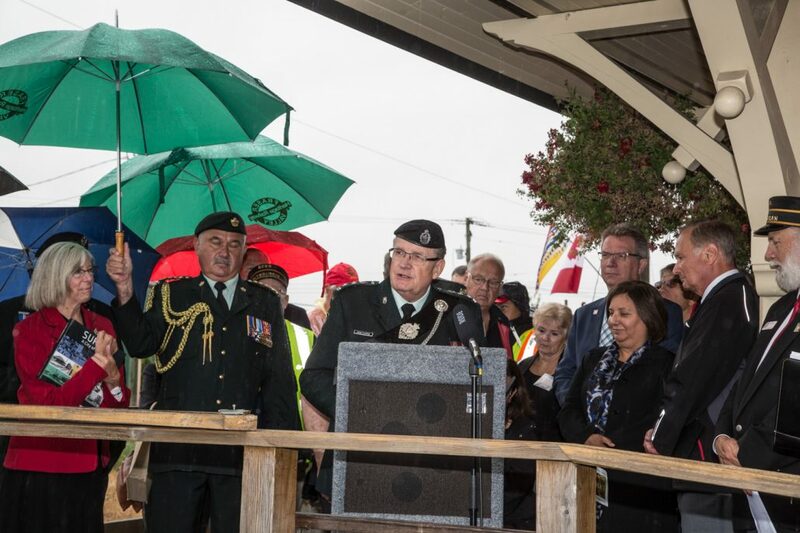 After the Lieutenant Governor’s speech 1304 Connaught arrived and broke the ribbon. 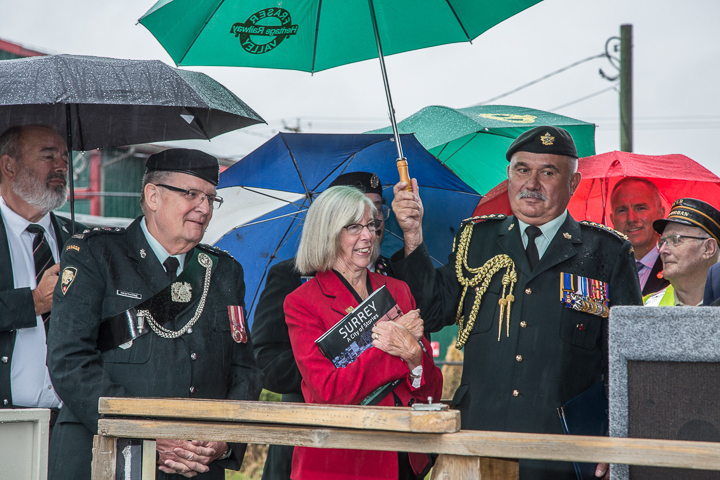 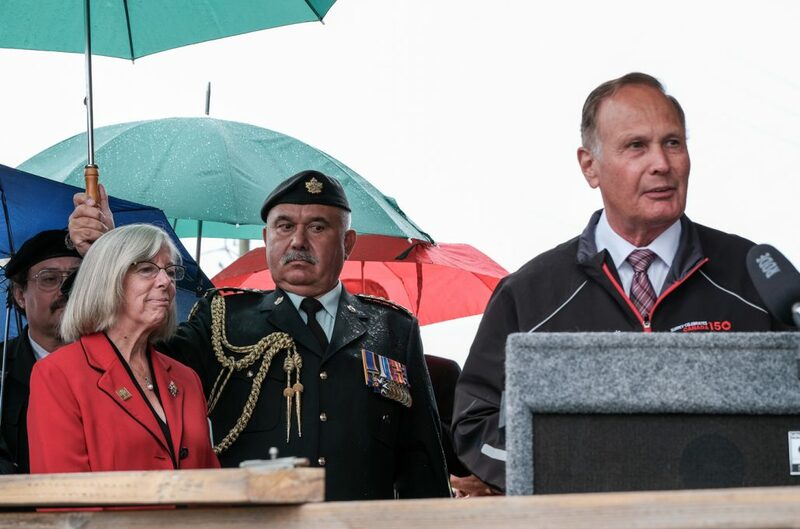 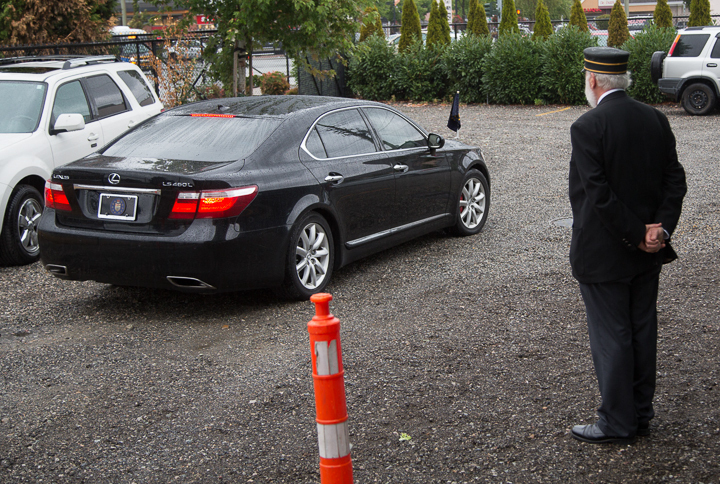 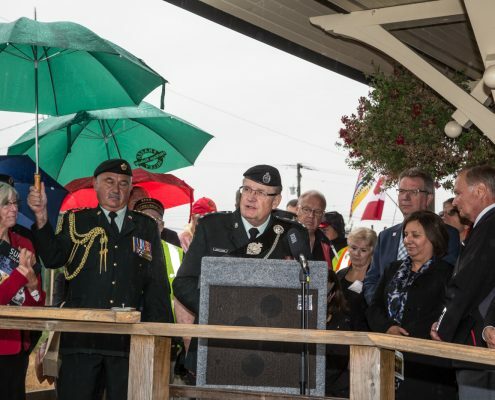 The Honour Guard saluted the car and were probably thankful it was almost over as the rain came down. 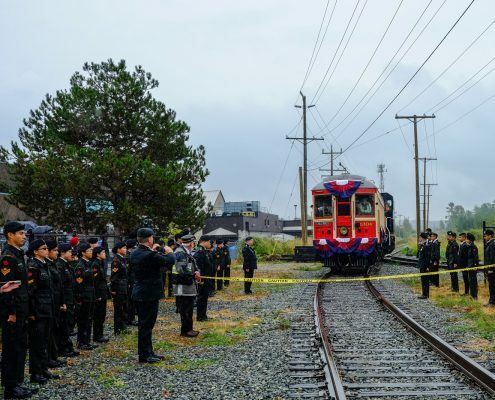 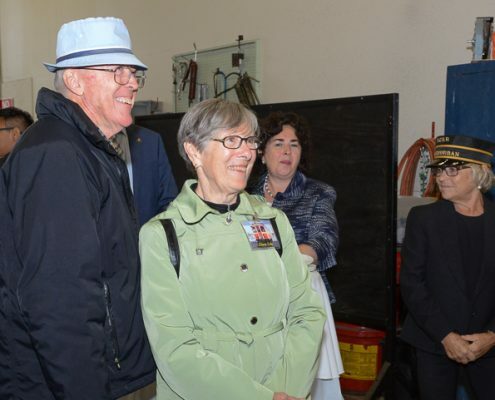 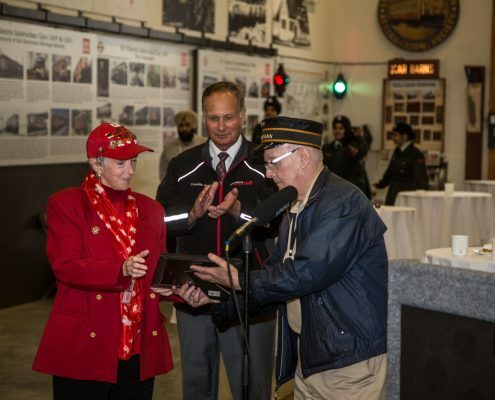 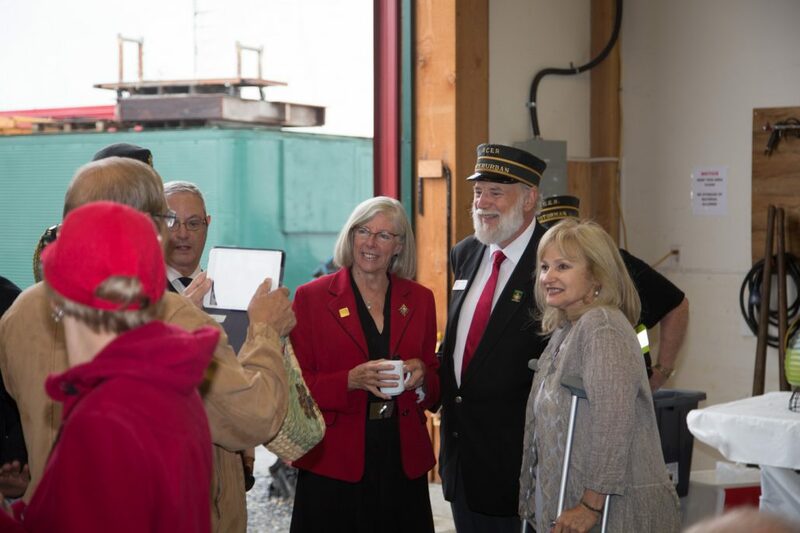 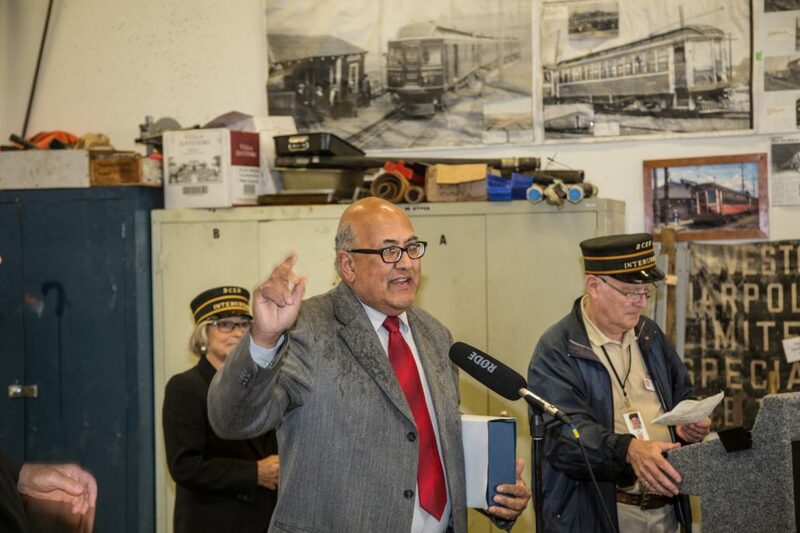 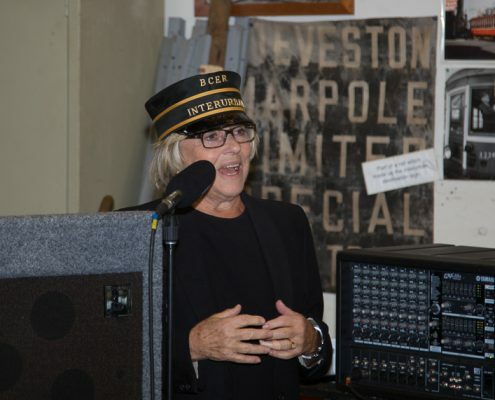 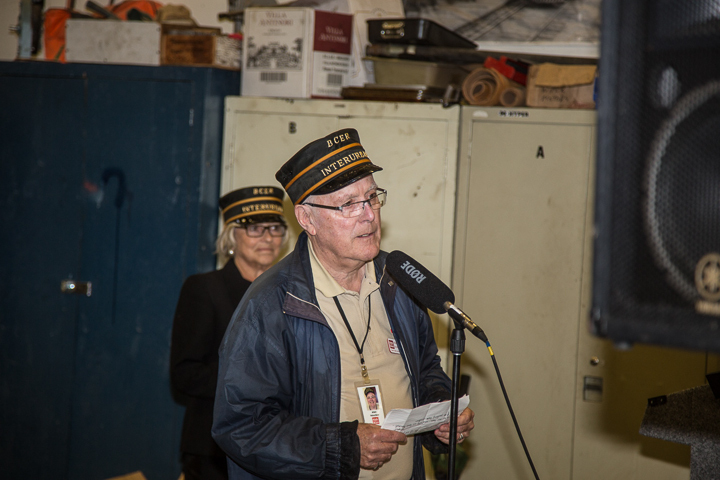 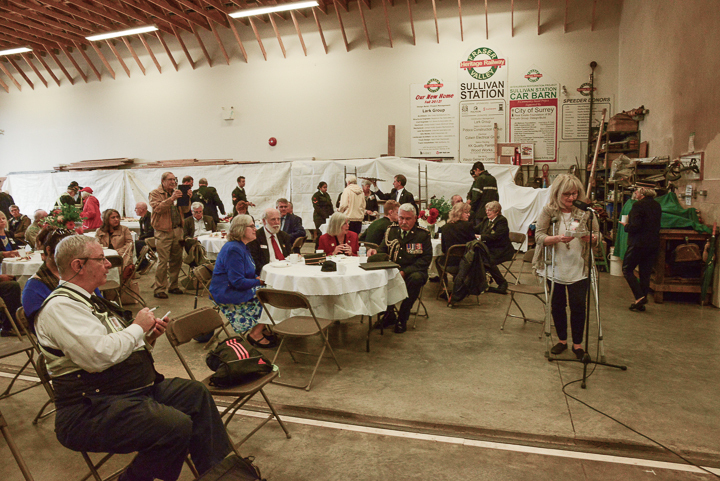 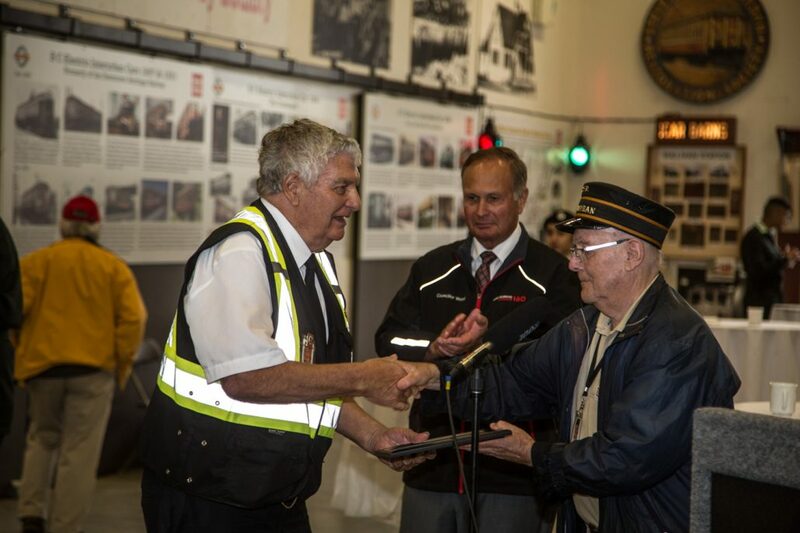 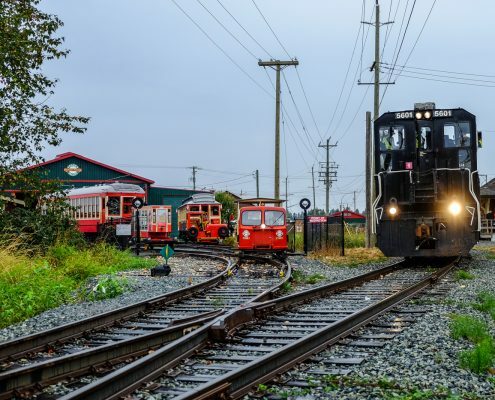 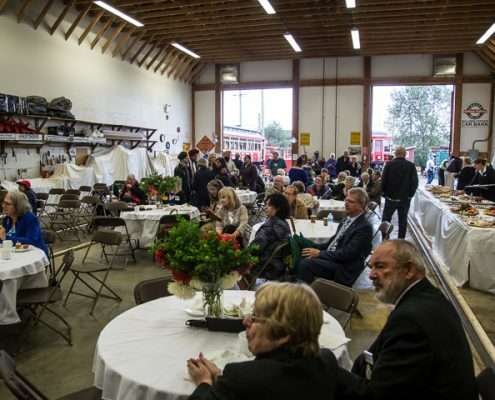 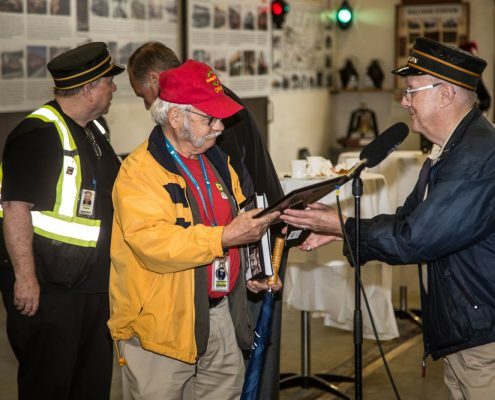 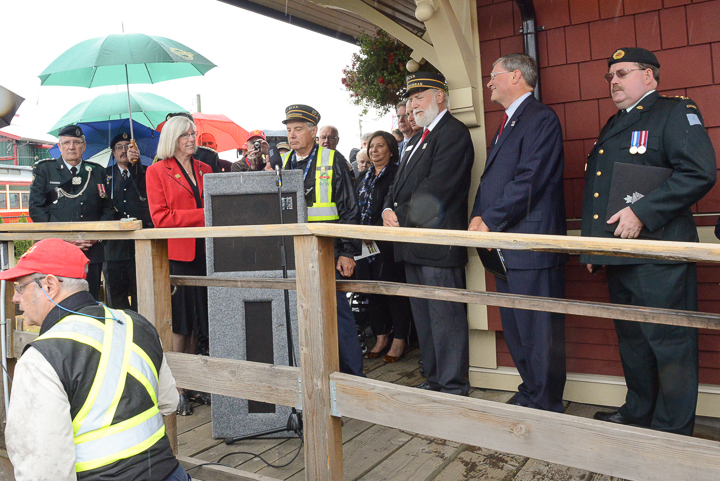 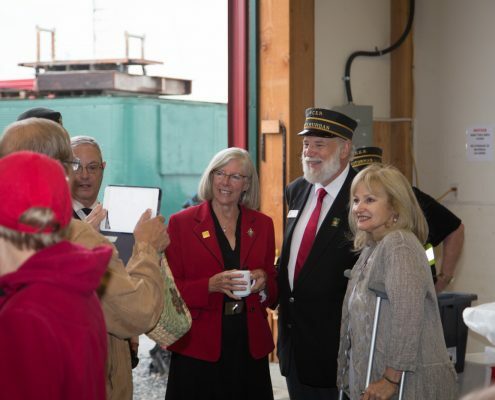 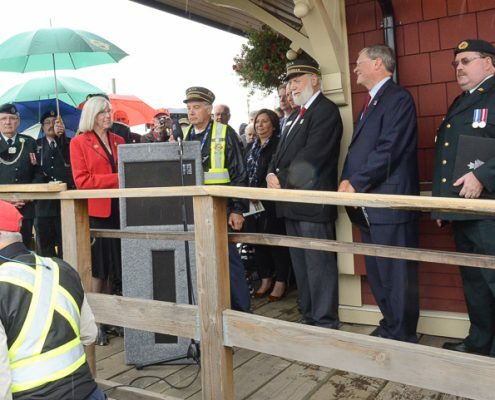 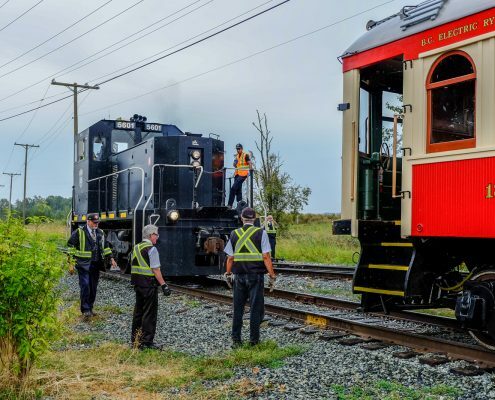 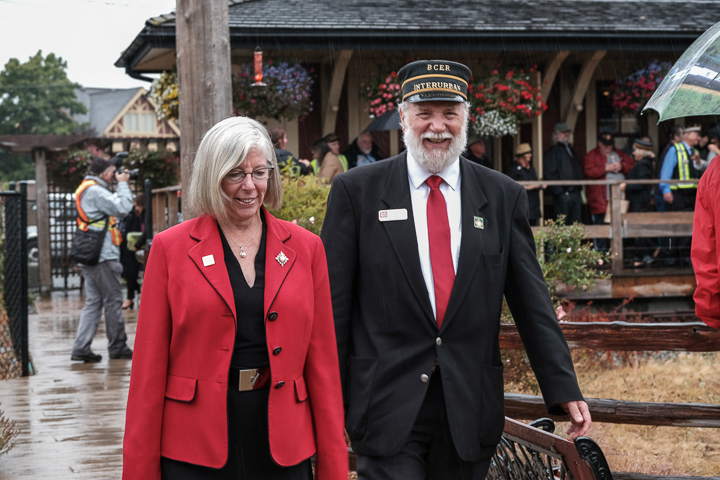 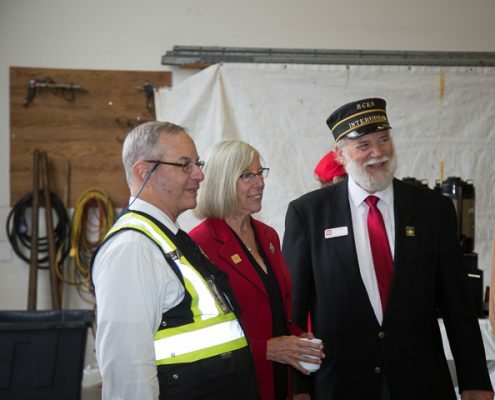 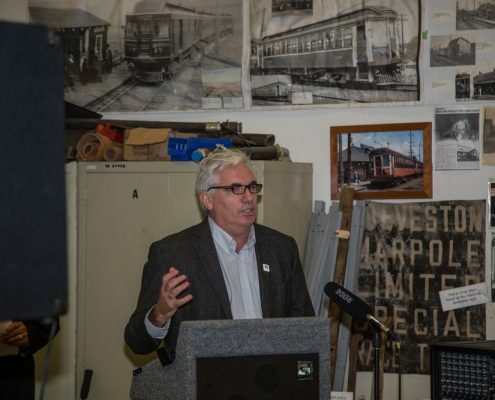 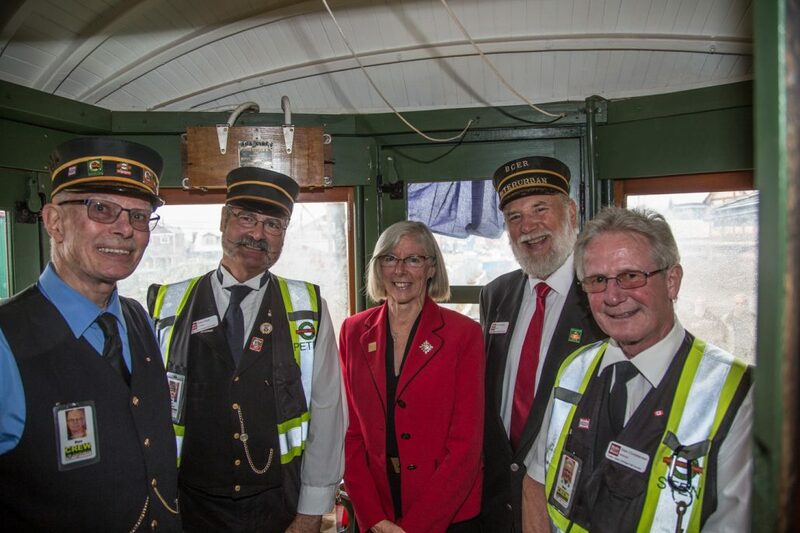 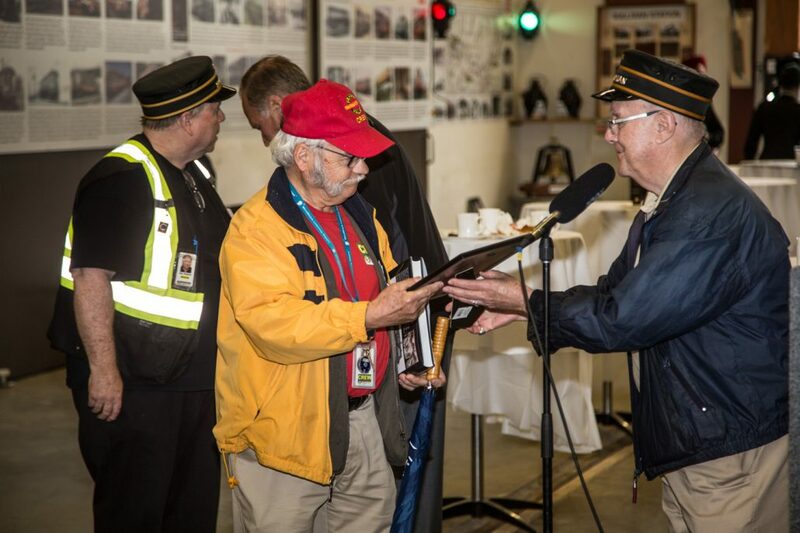 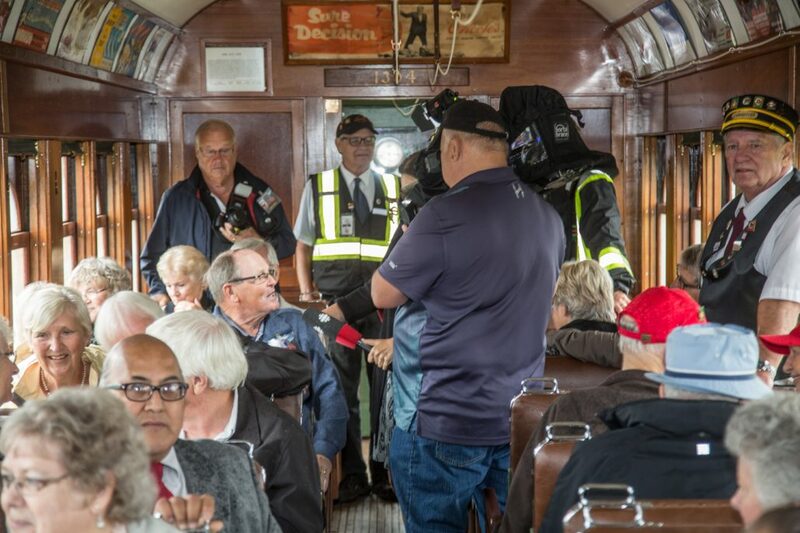 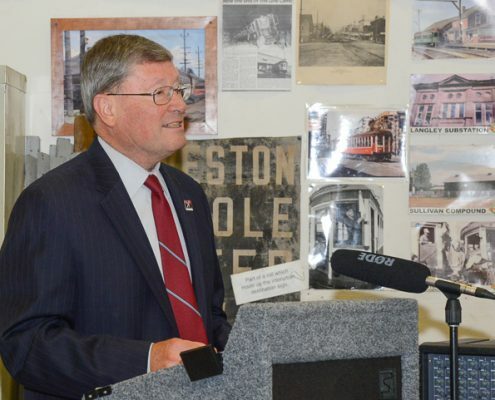 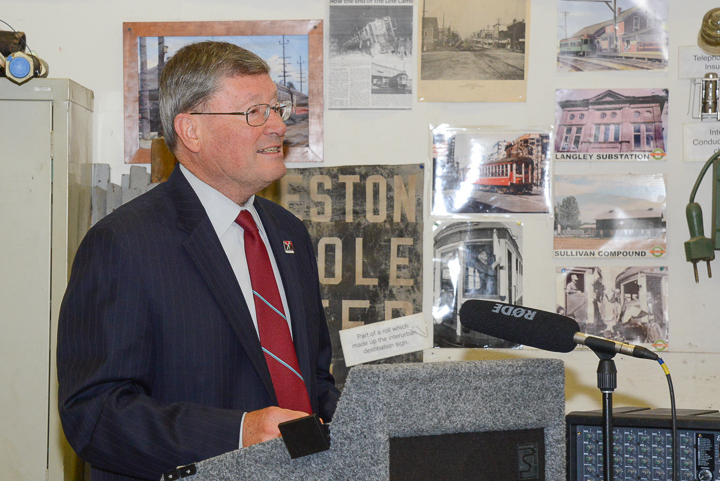 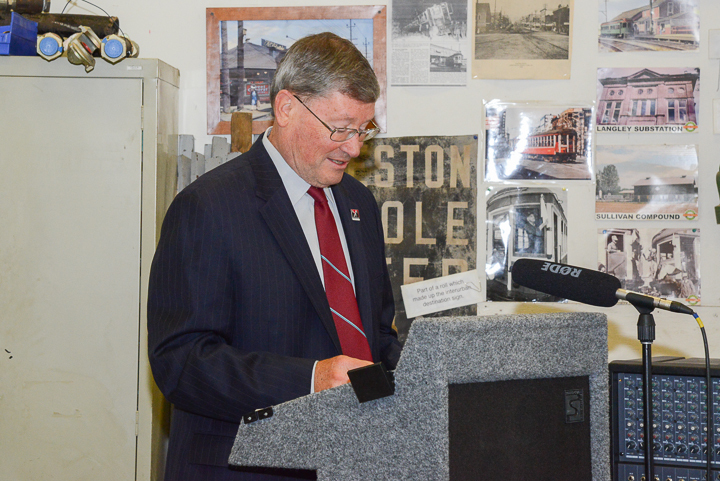 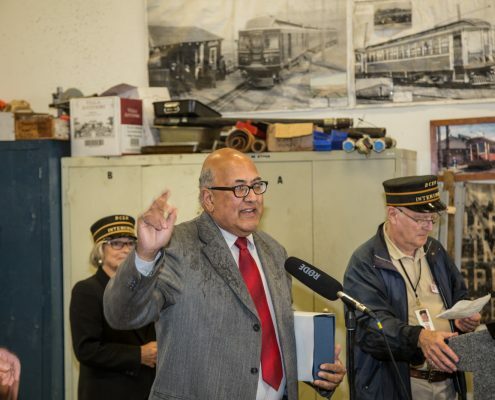 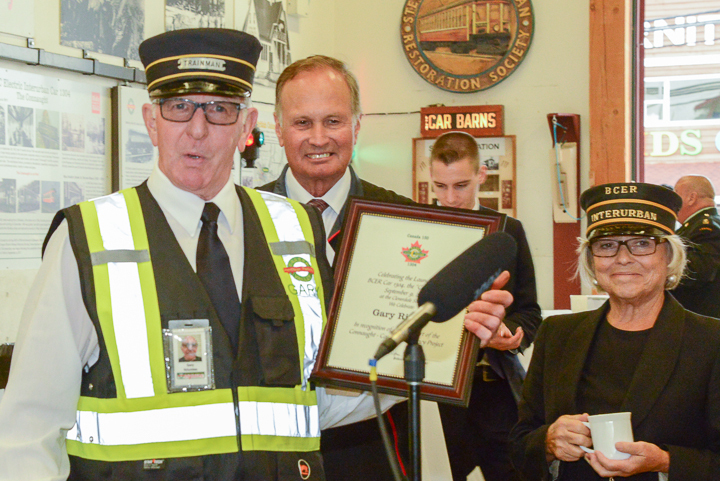 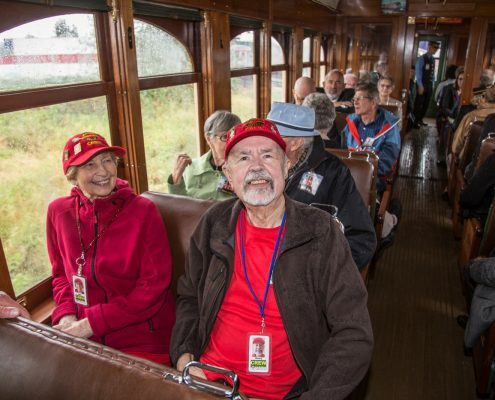 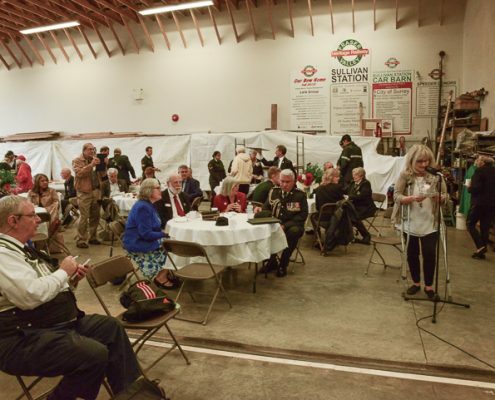 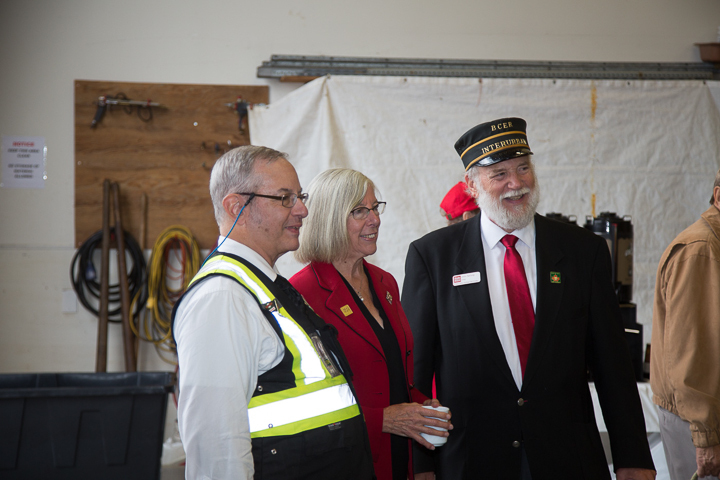 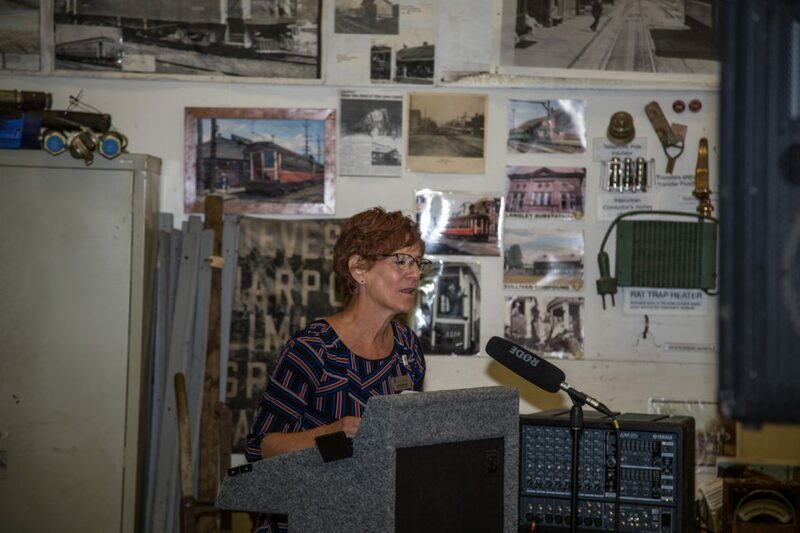 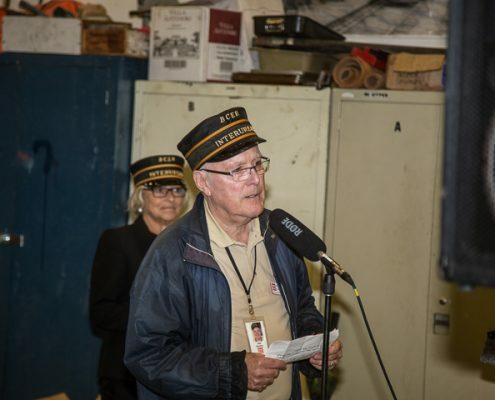 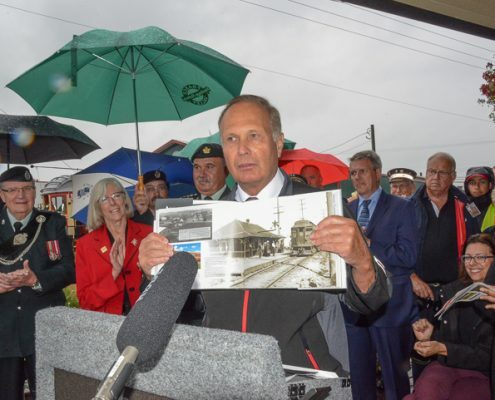 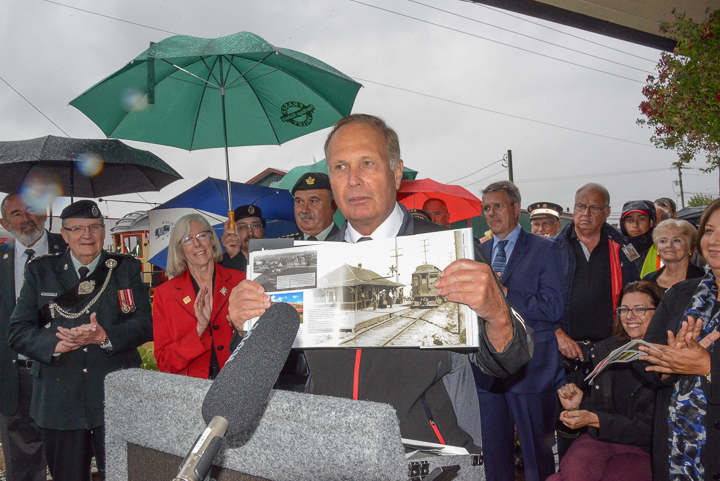 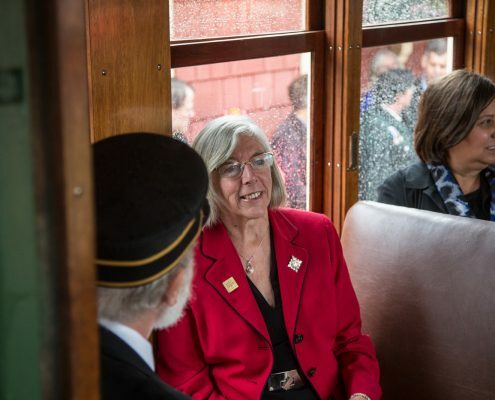 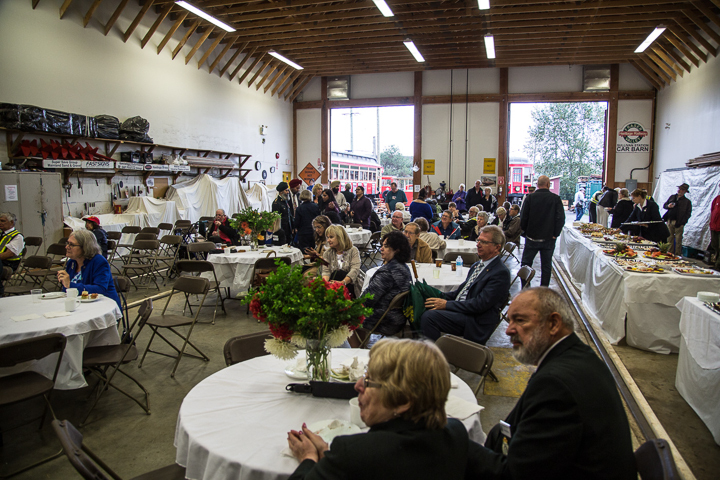 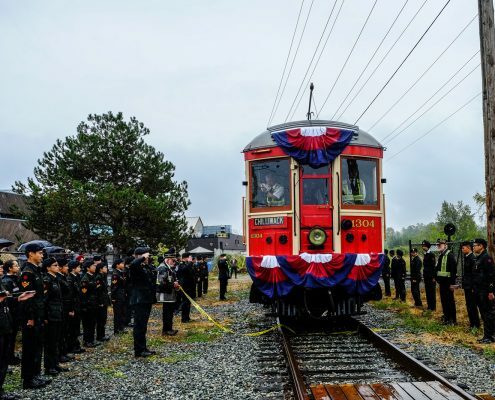 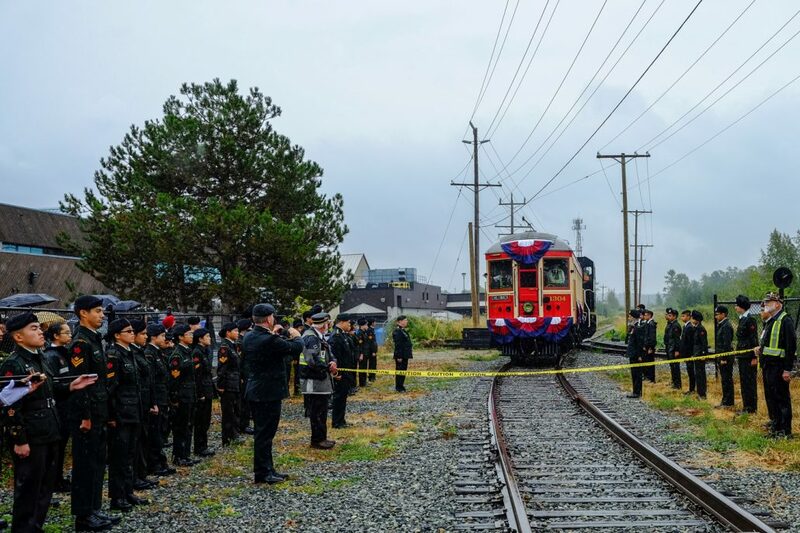 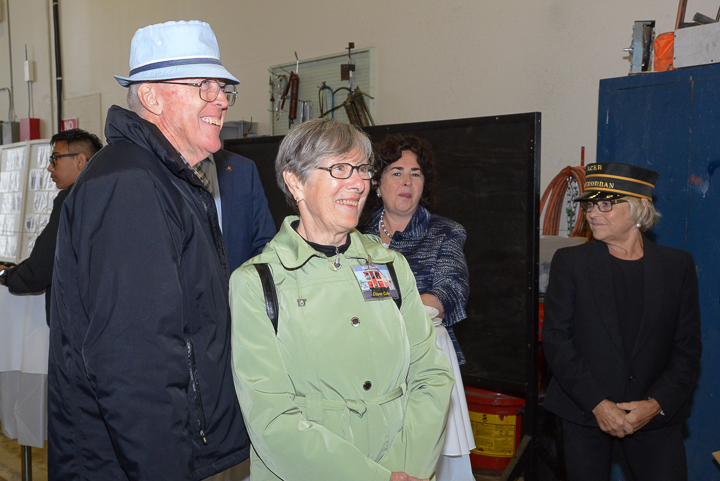 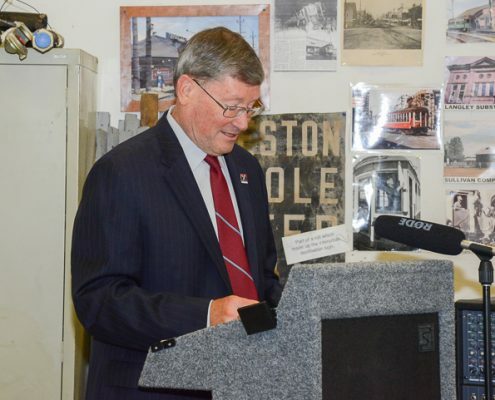 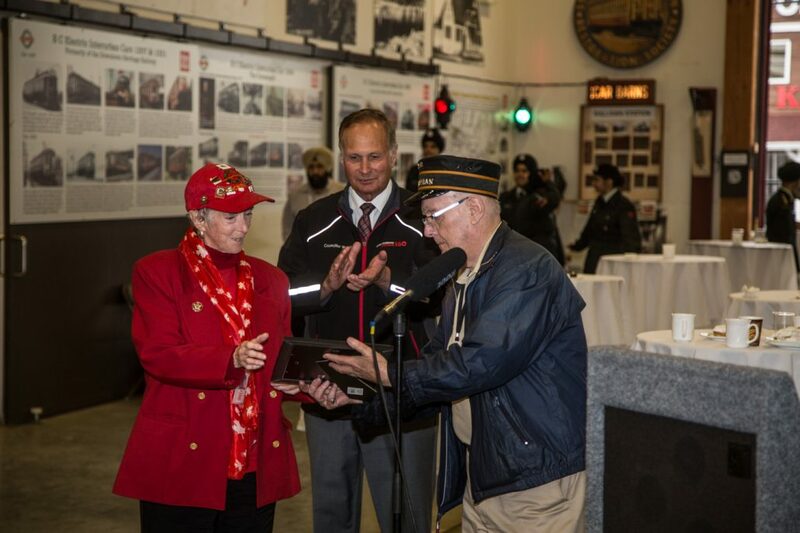 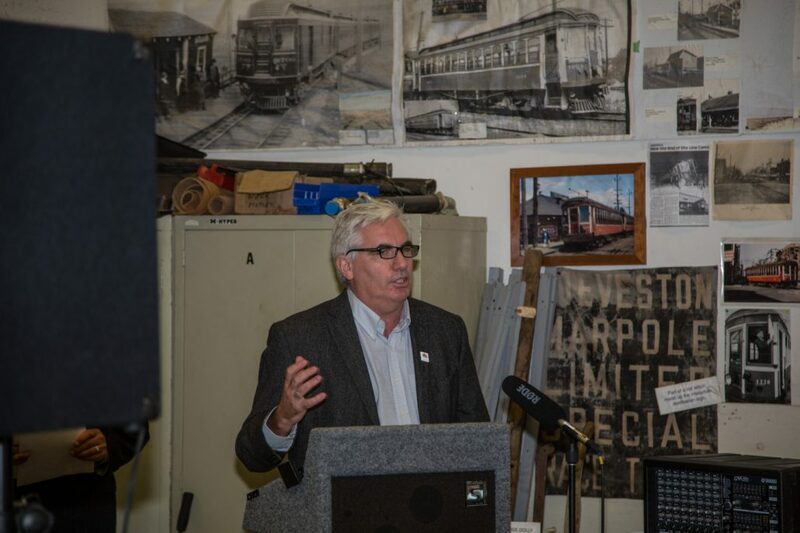 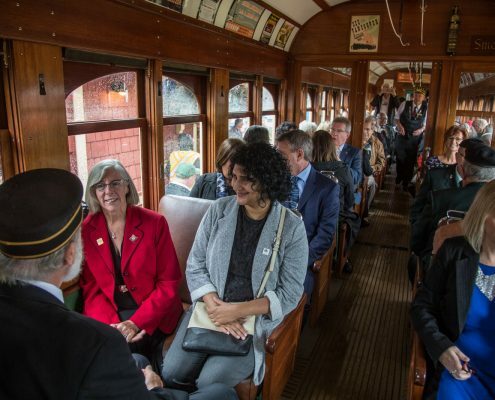 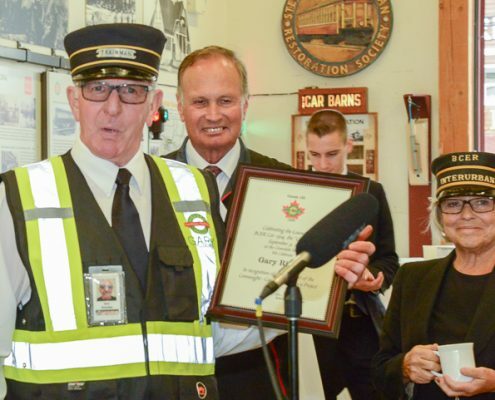 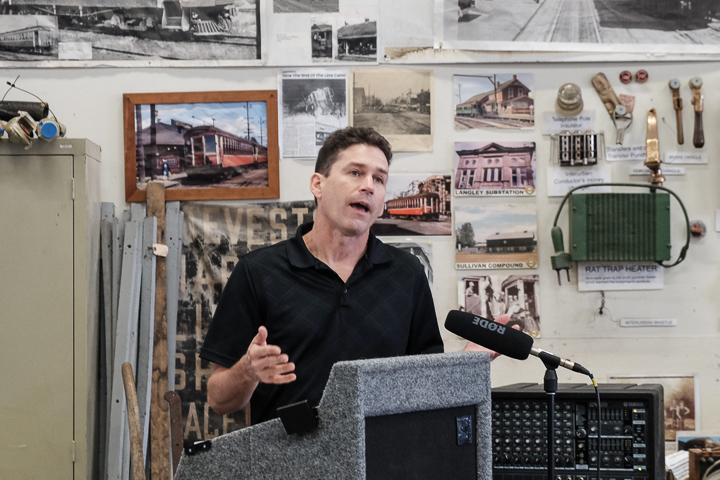 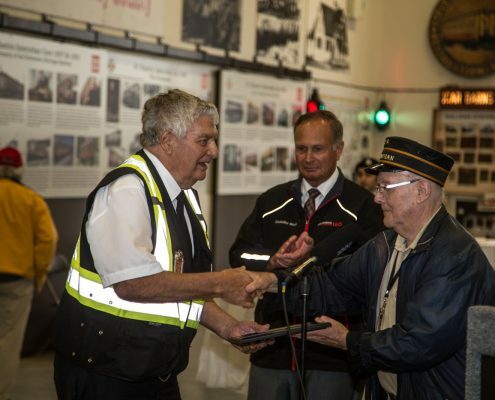 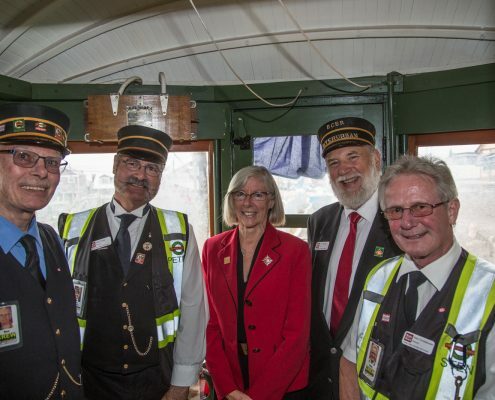 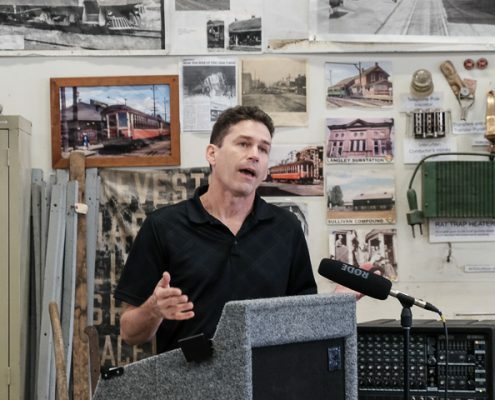 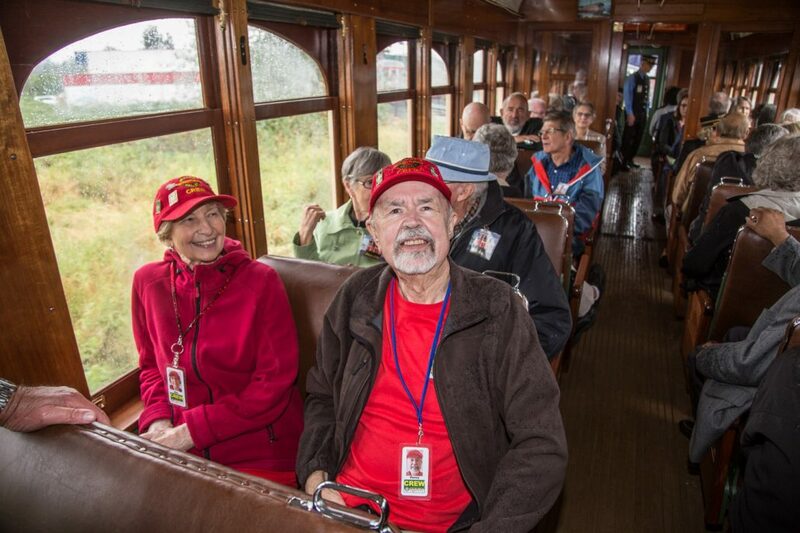 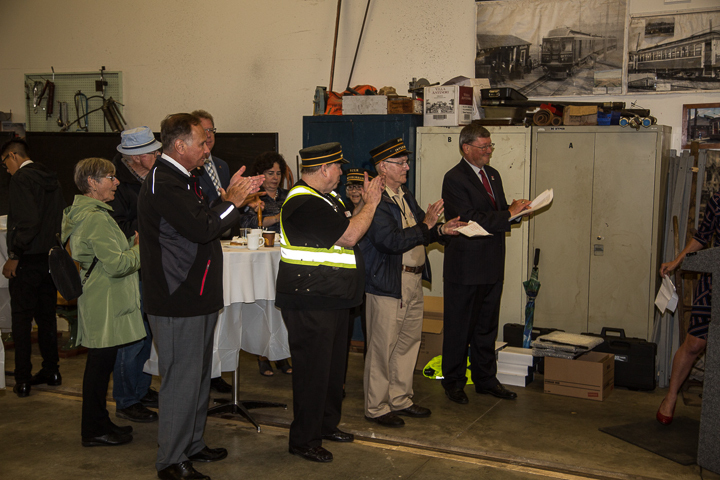 But wait, there’s more – the other members of the platform party each had something nice to say about the day, the event and remembrances of transportation days gone by. 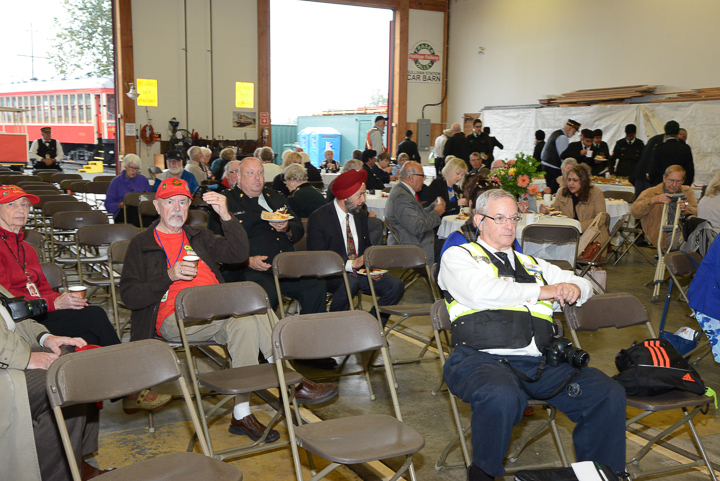 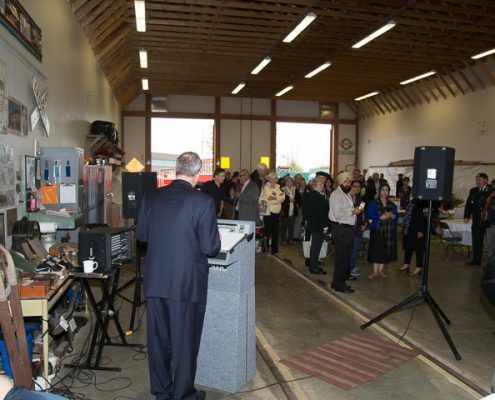 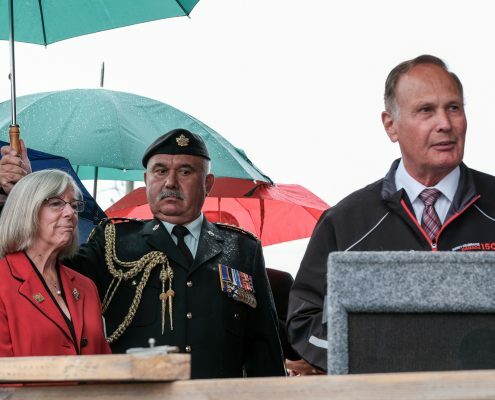 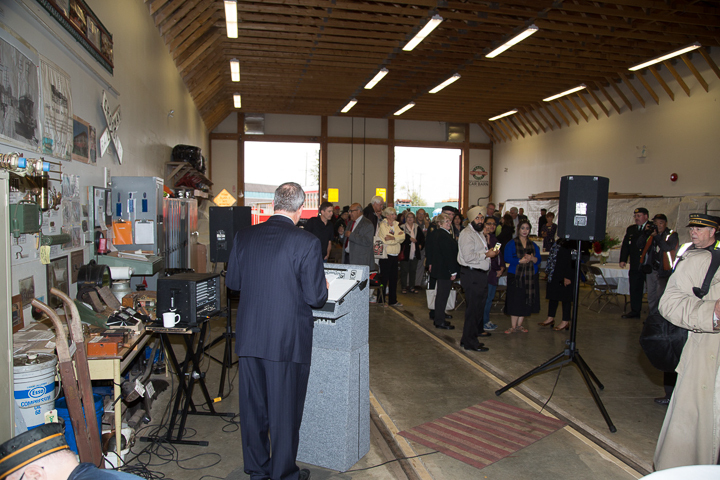 Mr. John Aldag, MP for Cloverdale- Langley City spoke. 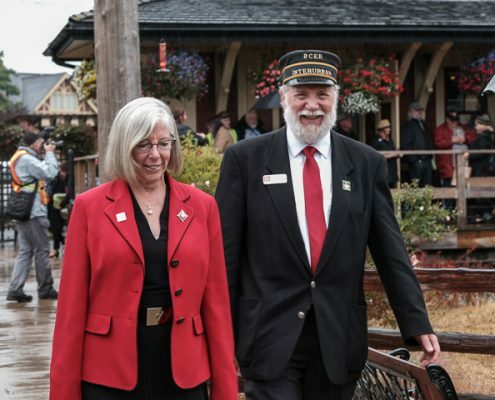 His riding actually starts across the street from us, the station and car barn are just in the South Surrey – White ROck riding of Dianne Watts, MP, and our former Mayor of Surrey. 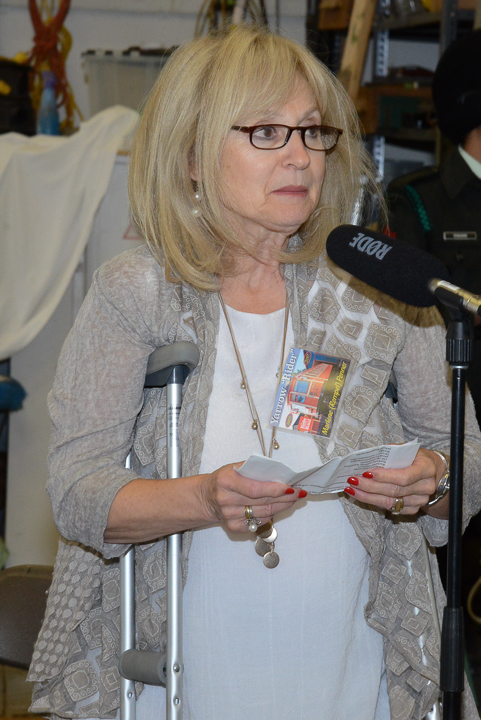 Dianne was unable to attend due to pressing meetings in Ottawa, so our MC Mr. Don Evans shared her kind comments and regrets. 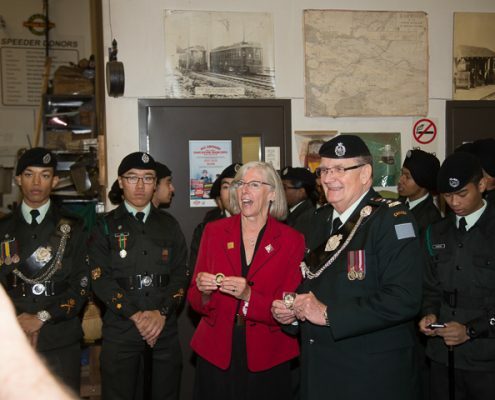 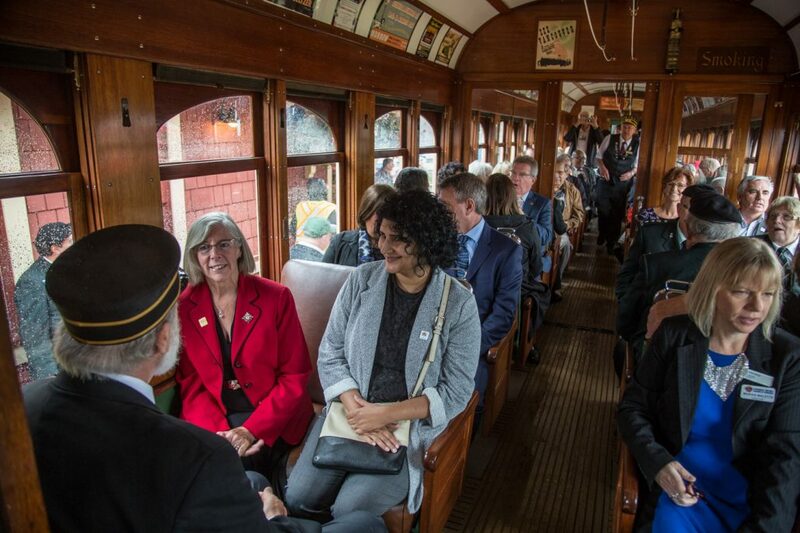 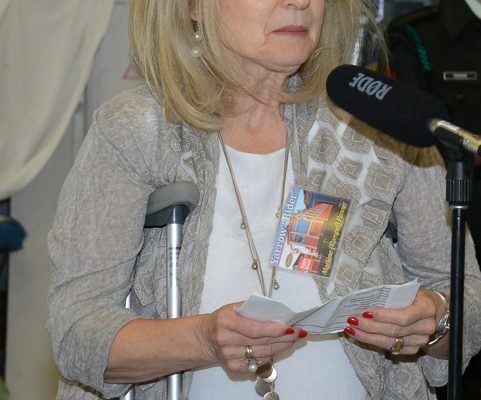 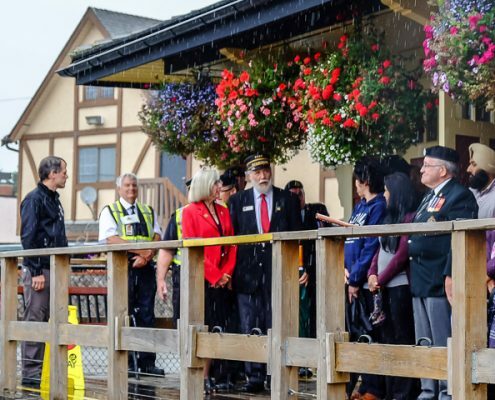 Our excursion crossed a few political boundaries as we go into the provincial riding of Surrey Panorama now represented by the Honourable Jinni Simms, Minister of Citizens Services. 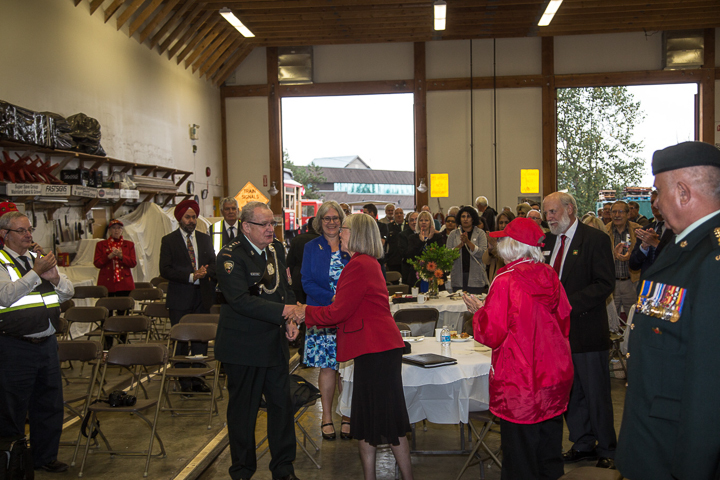 This riding has also been represented by Mr. Marvin Hunt as MLA after his service as Surrey Councillor for many years. 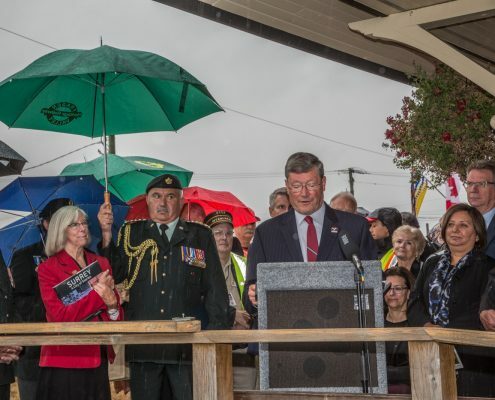 Mr. Hunt now represents the riding of Cloverdale as our MLA. 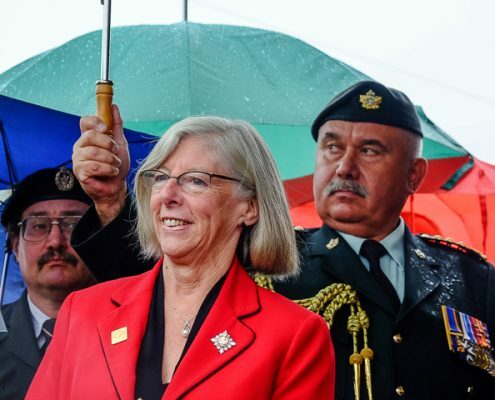 We like to think that as he has been a great supporter of the FVHRS for many years, he is really just moving closer to us. 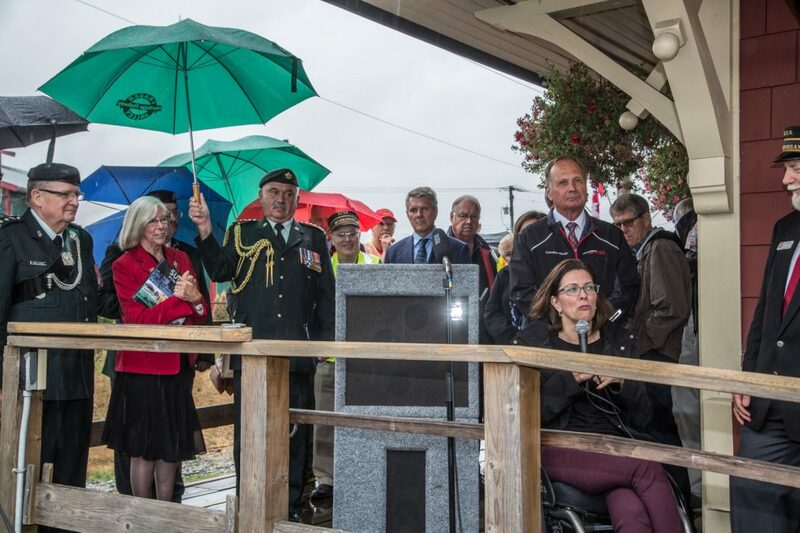 We were also delighted to have our previous MLA who now represents South Surrey, Ms. Stephanie Cadieux, roll up to say a few words. 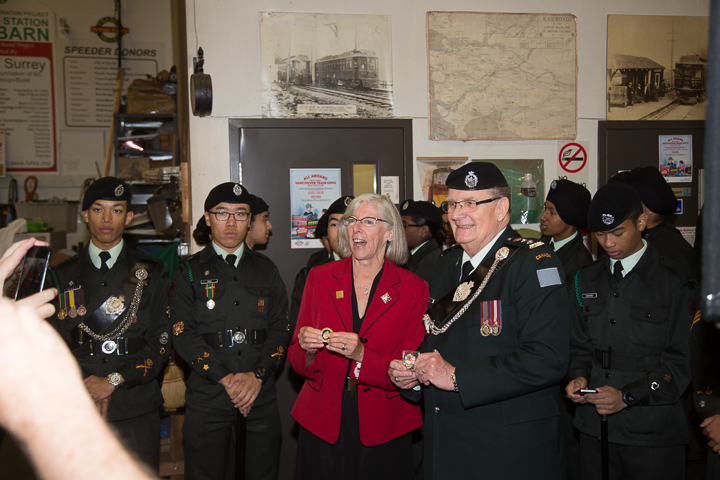 We also enjoyed hearing more about the BC Regiment, Duke of Connaught’s Own Rifles, or “The Dukes” from their Honorary Col. Ted Hawthorne. 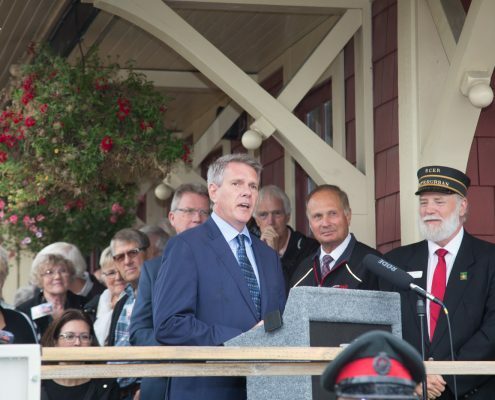 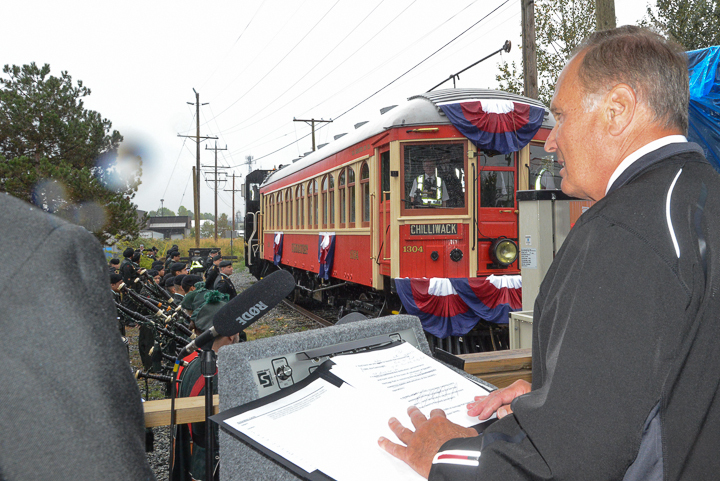 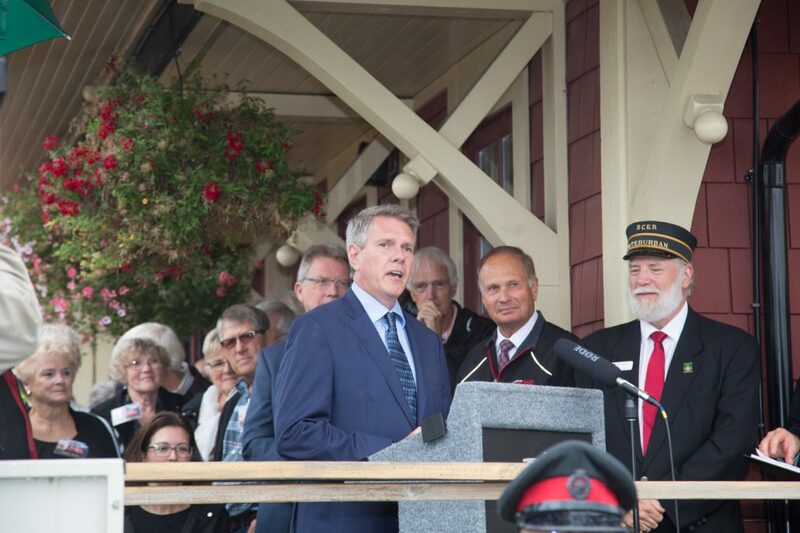 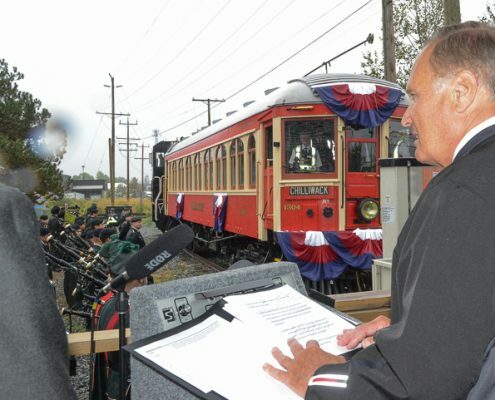 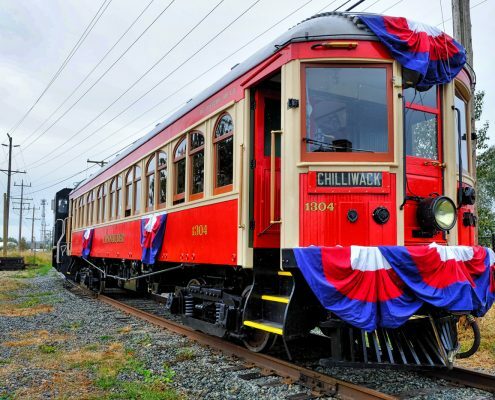 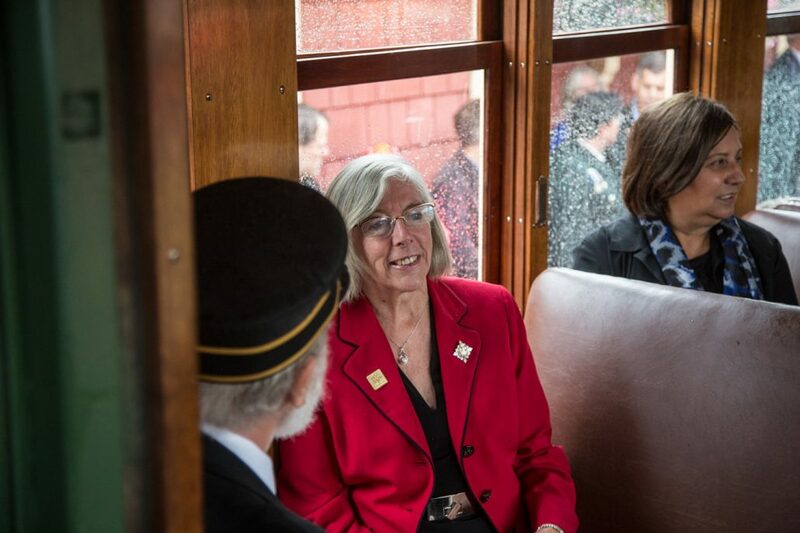 With the speeches completed, the platform party moved to board the train for the inaugural run along our spur. 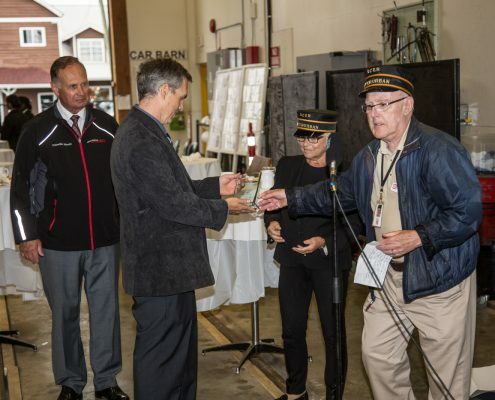 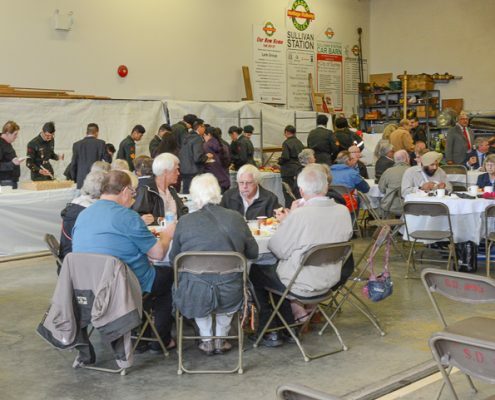 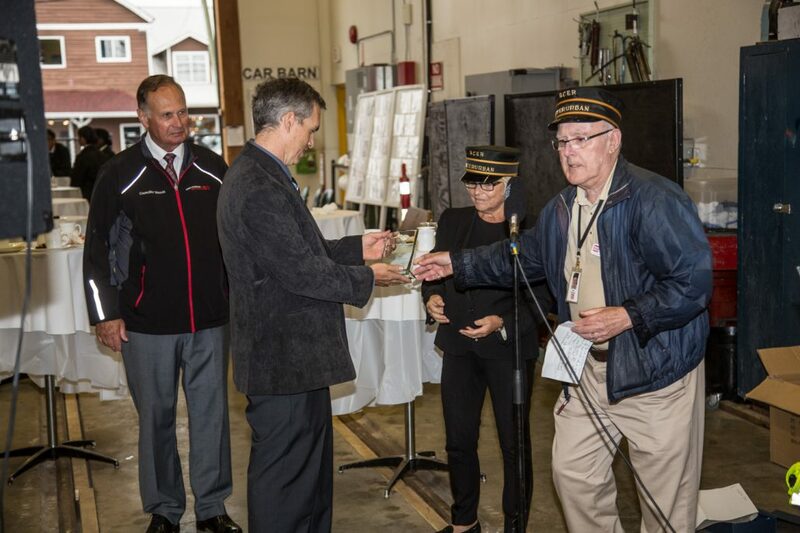 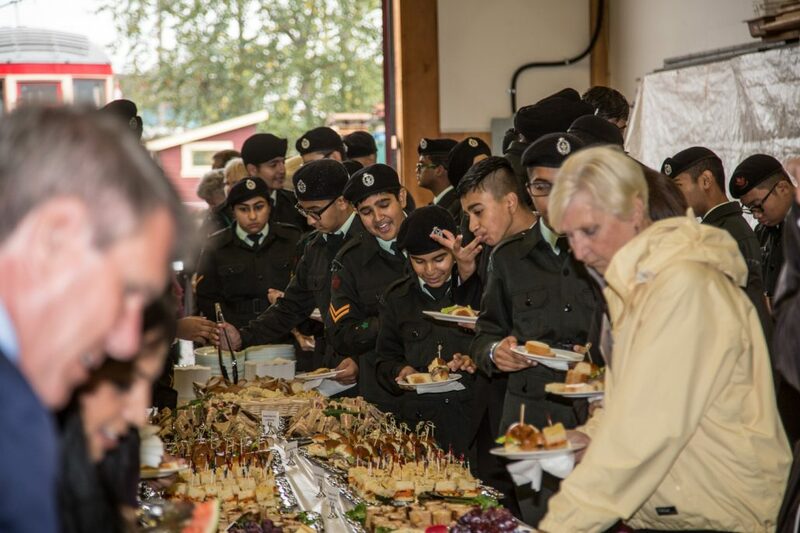 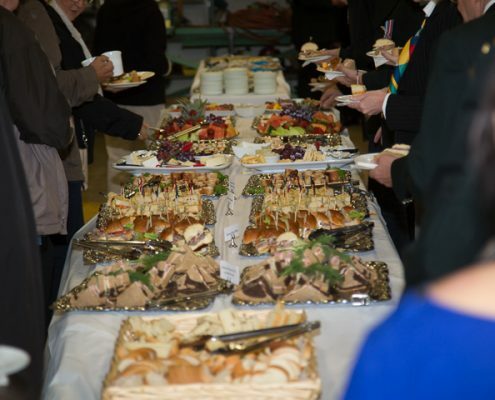 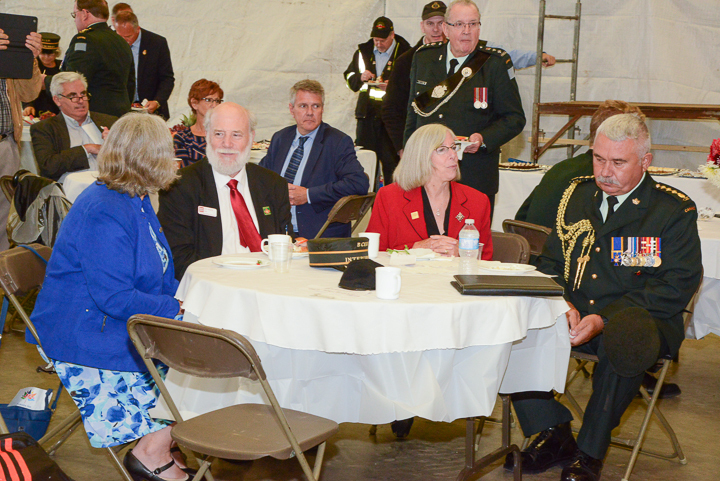 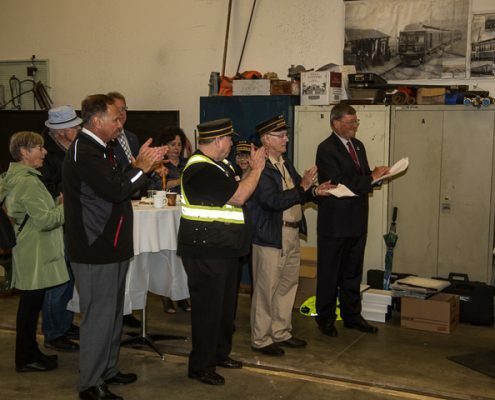 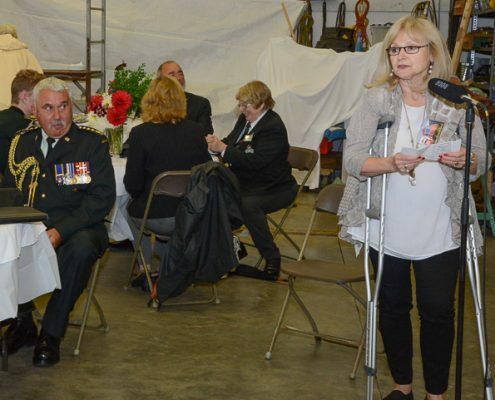 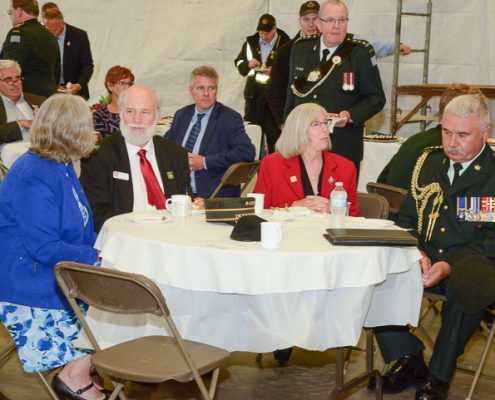 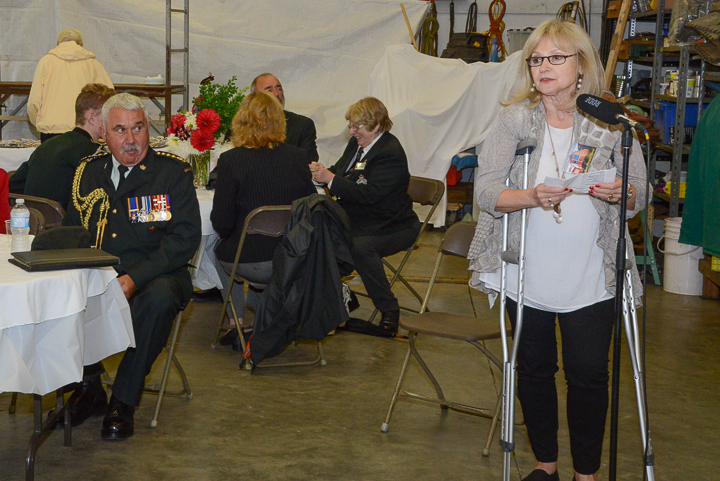 After the ride the LG and special guests, along with the military members moved to the Carbarn for a catered lunch courtesy of Director Shane Suter and his firm, Arbor Memorial. 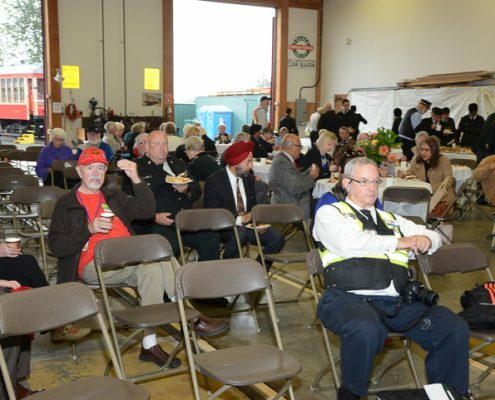 After lunch several presentations were made by special guests; Steve Higginbotham, Community Relations Coordinator with BC Hydro; Singh Biln, Chief Mechanical Officer and Community Relations Director with SRY Raillink; Steve Dooley, Executive Director of Surrey Campus, Simon Fraser University; and Marlyn Graziano, Vice-President of External Affairs with Kwantlen Polytechnic University. 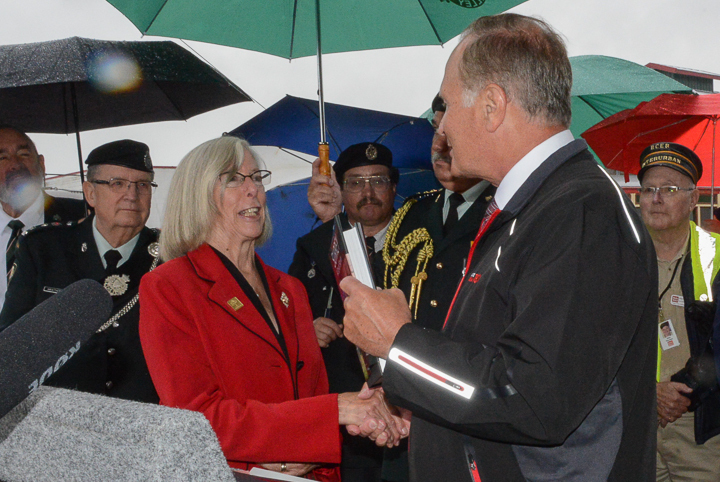 Presentations were followed by awards and certificates of appreciation for important contributions to the FVHRS. 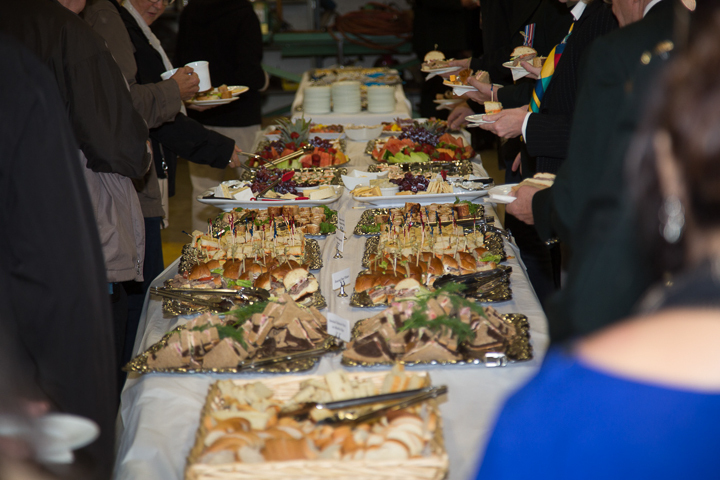 All images (C) copyright by FVHRS and the photographers. 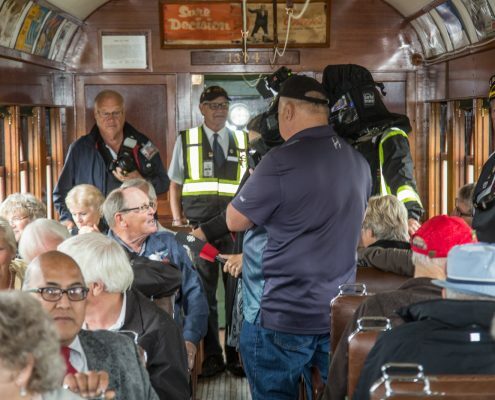 The movie recorded by FVHRS & Derek Hayes. 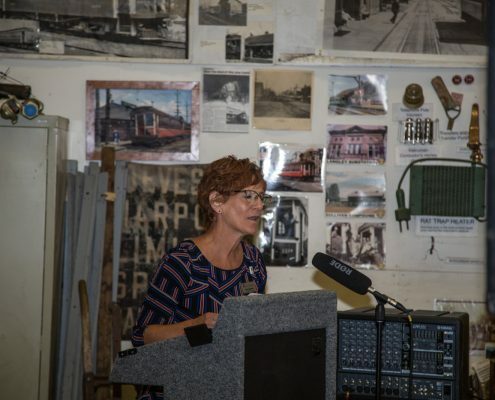 Frank Horne Heritage Discovery Centre. 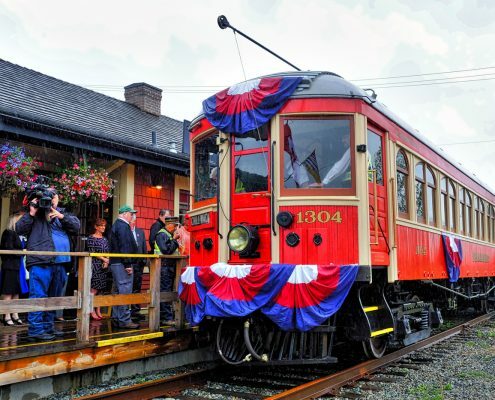 We are not open on Stat holidays except if on a weekend. 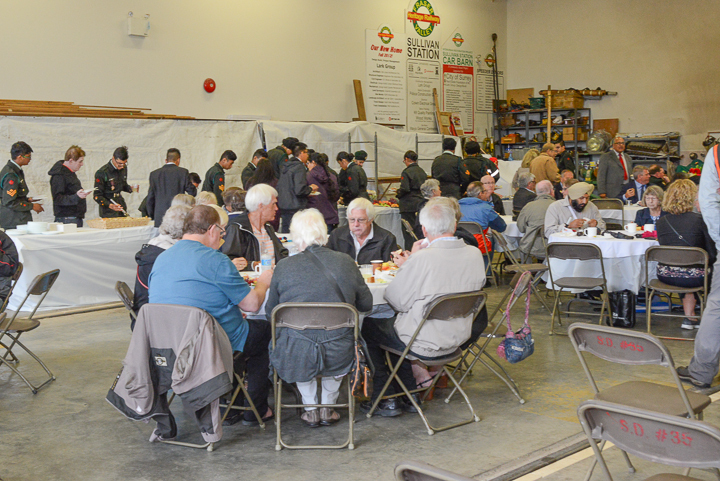 Find us at Hwy 10 and 176A Street, in Cloverdale. 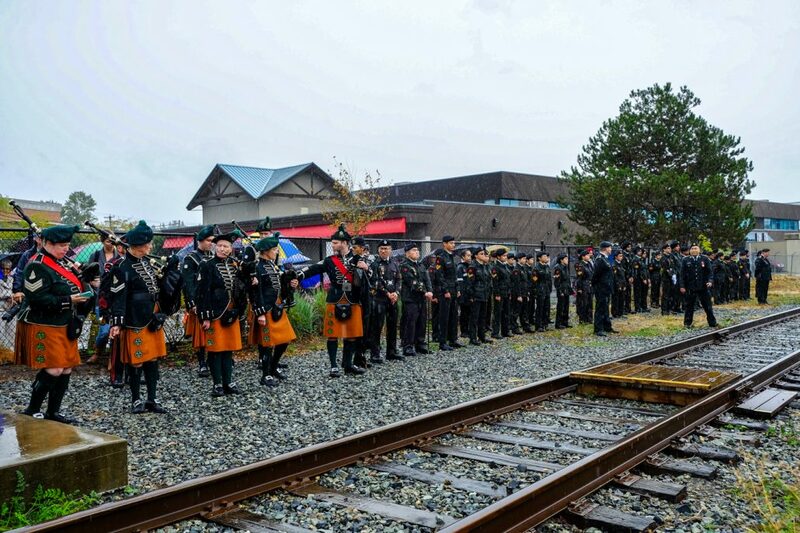 Behind the Clydesdale Inn.